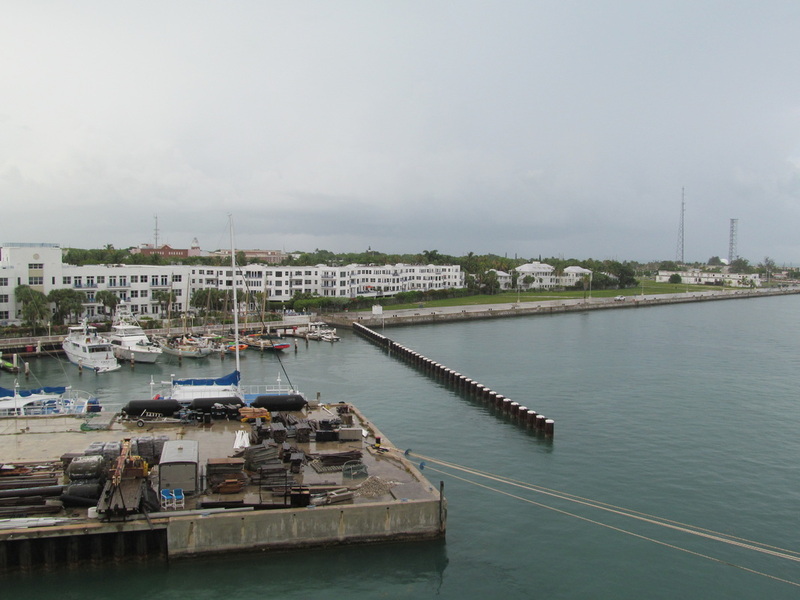 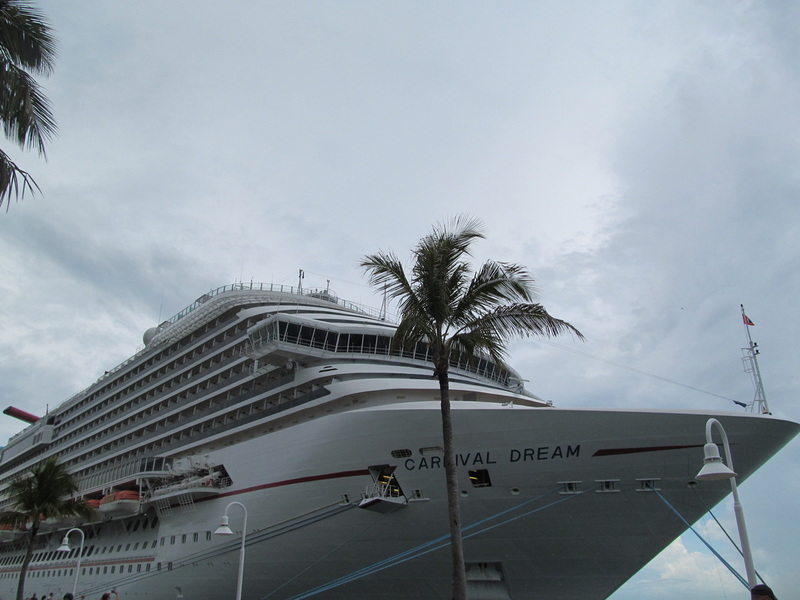 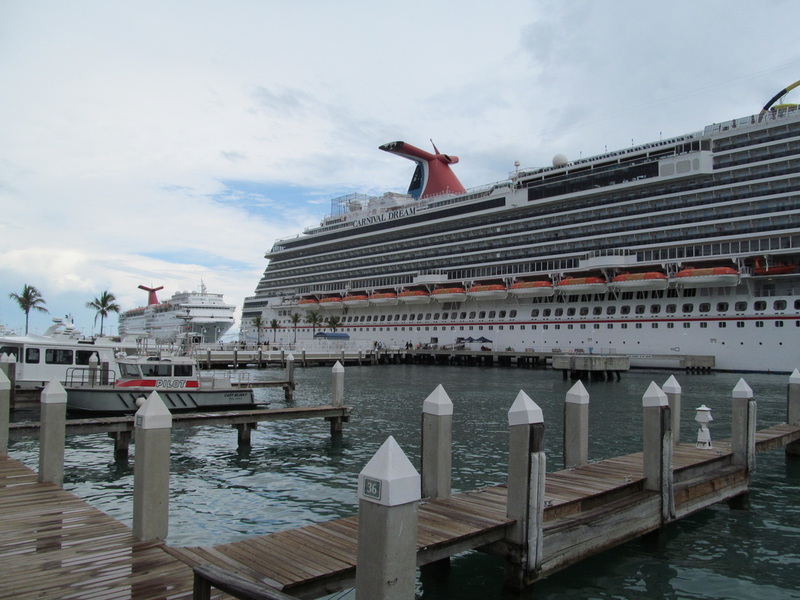 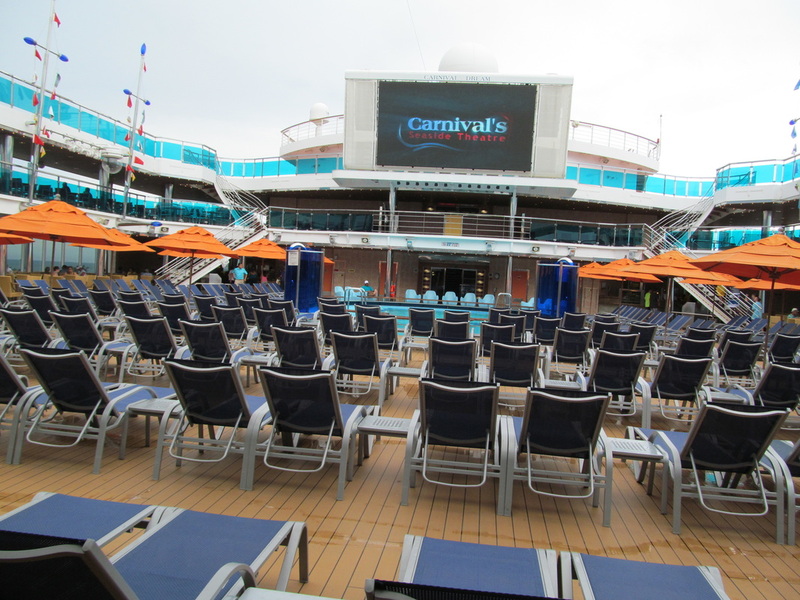 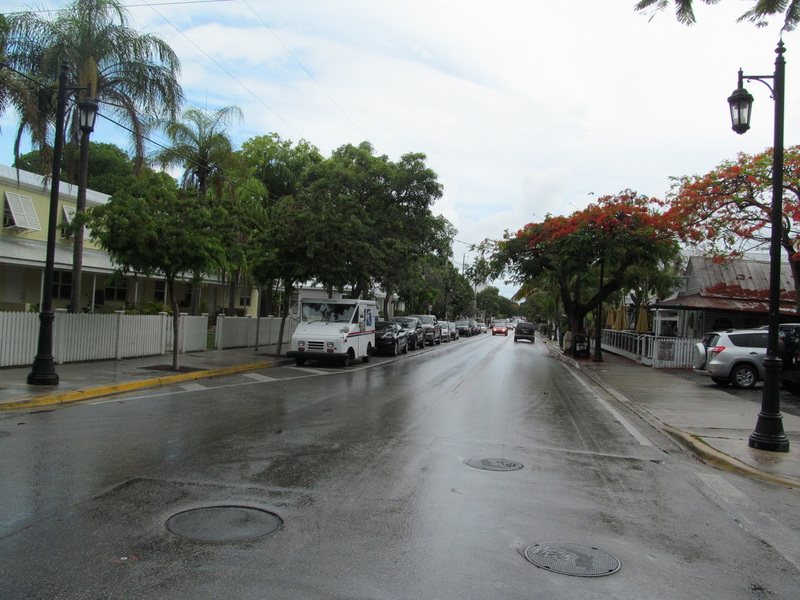 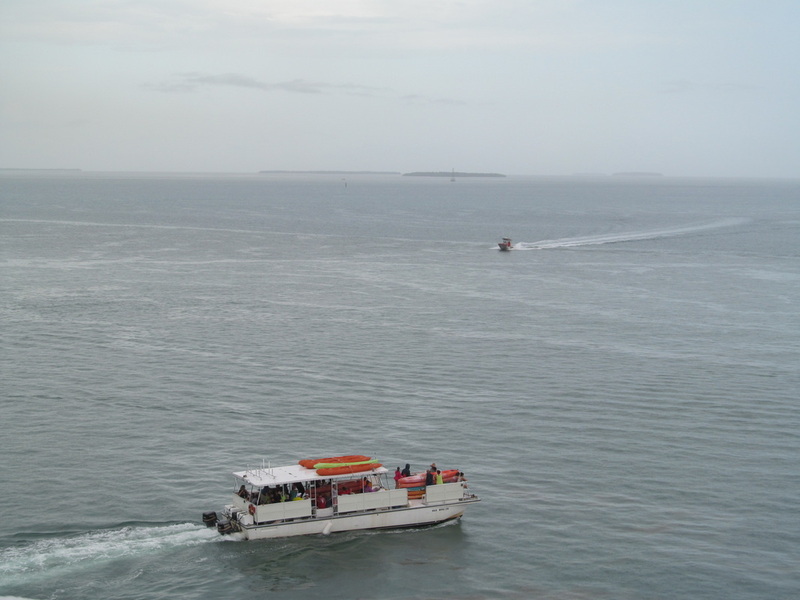 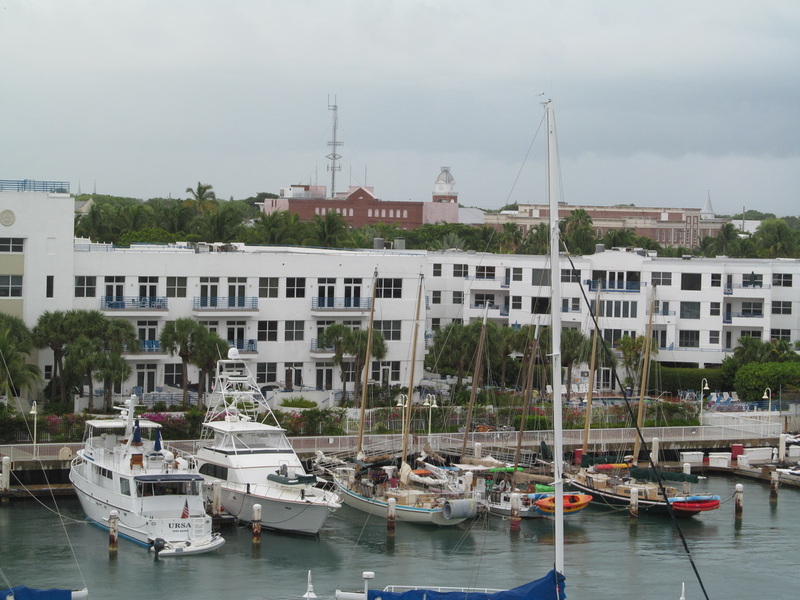 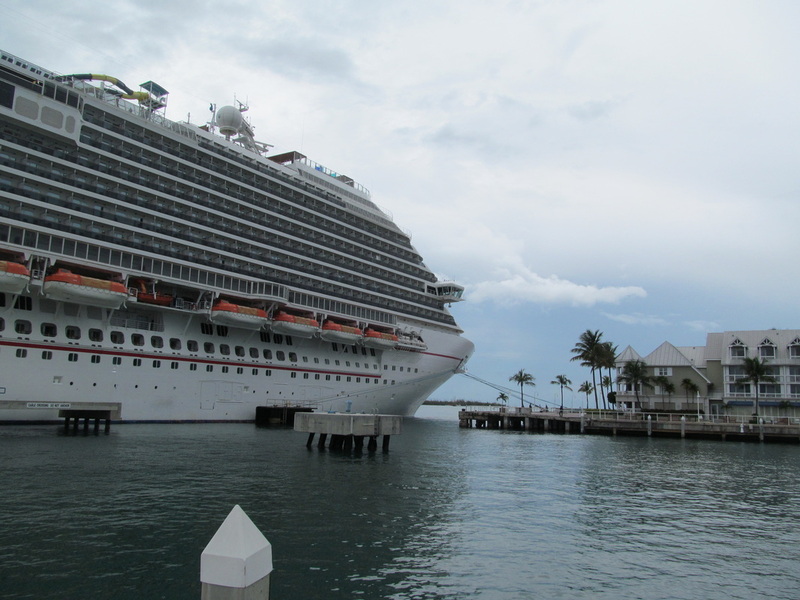 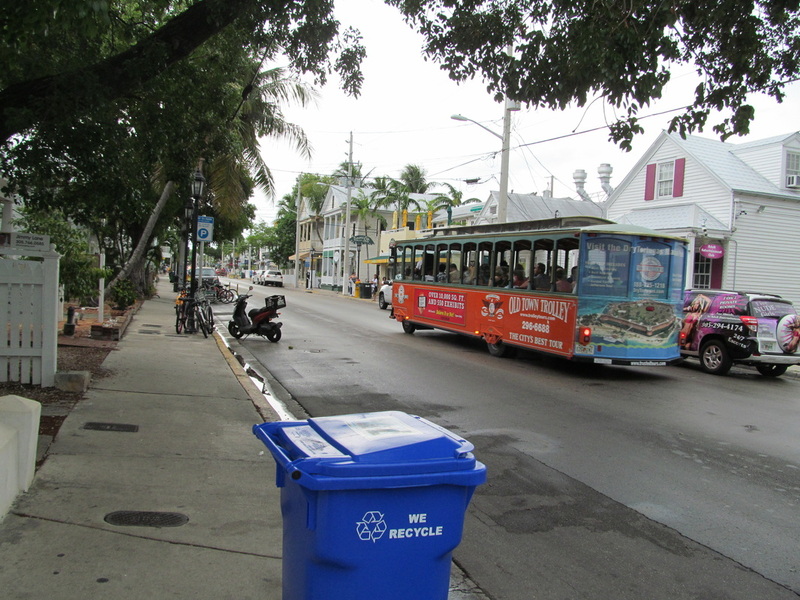 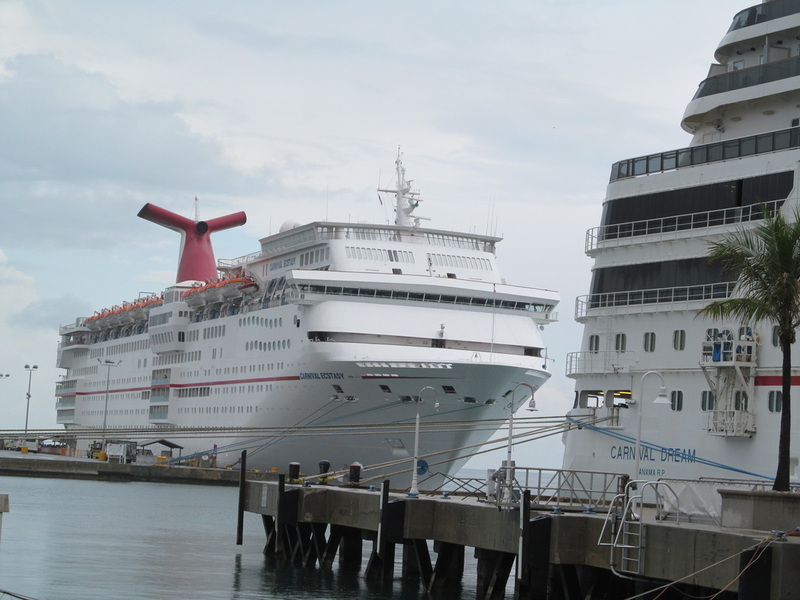 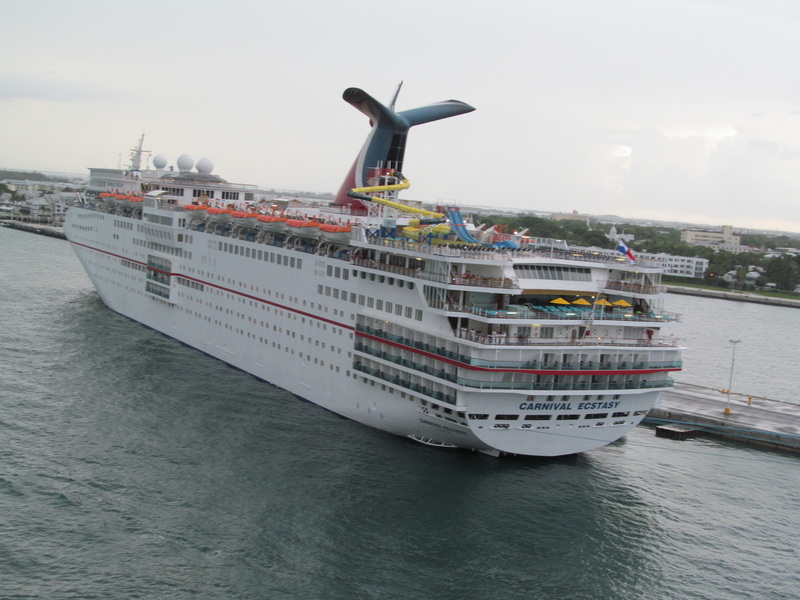 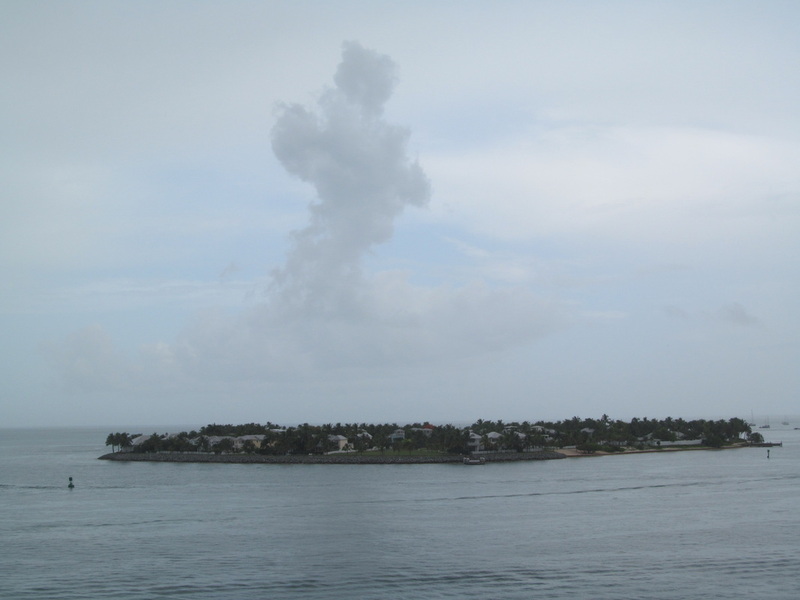 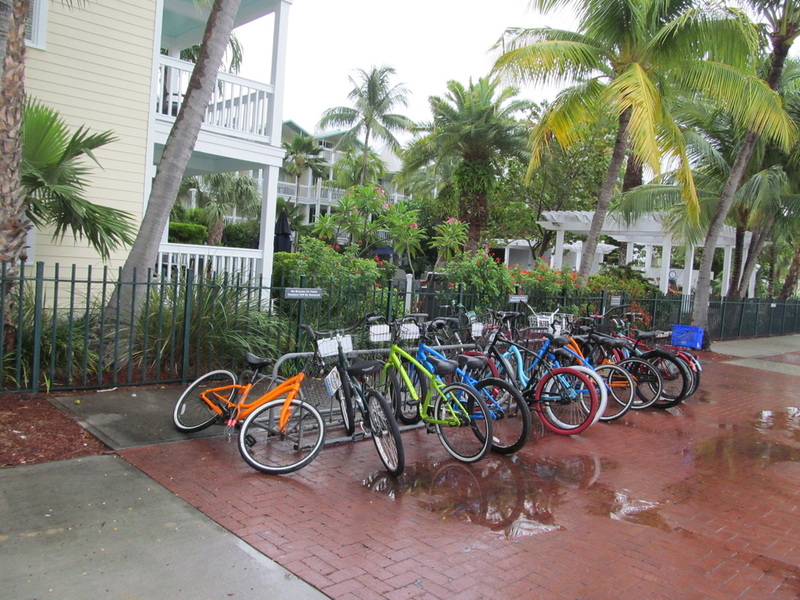 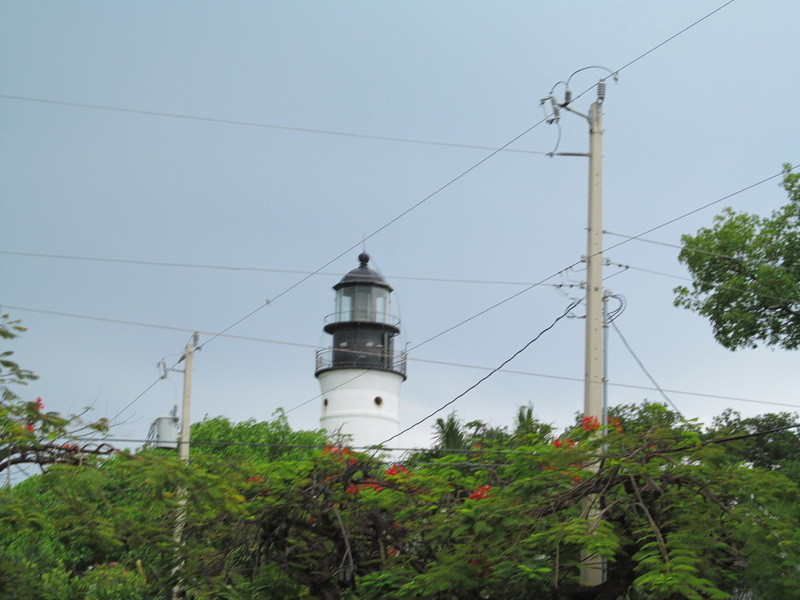 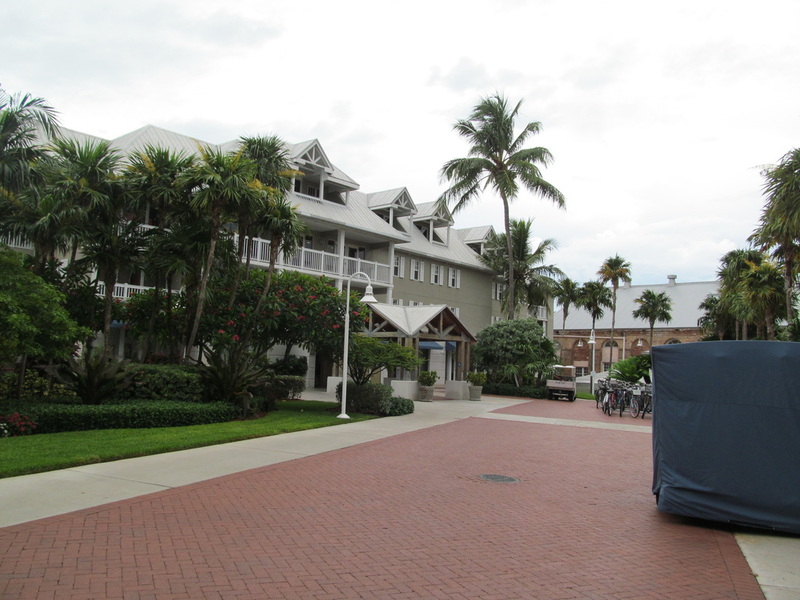 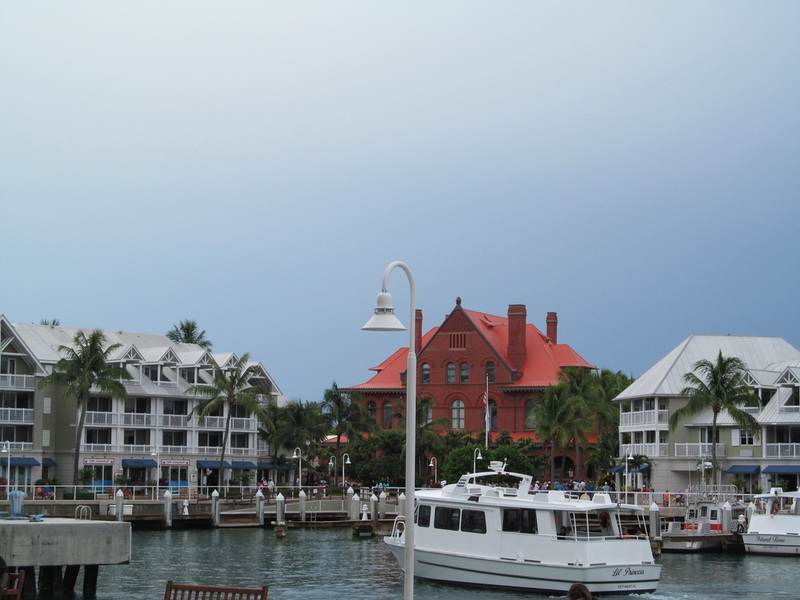 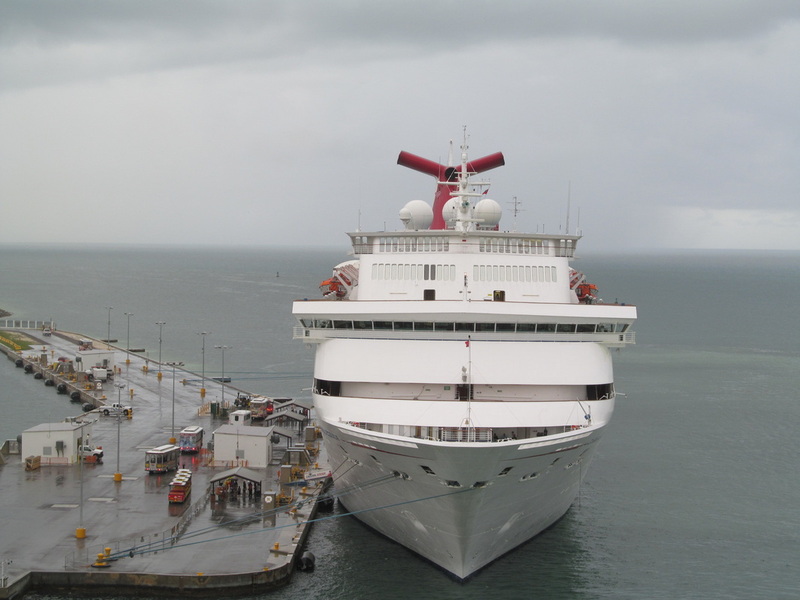 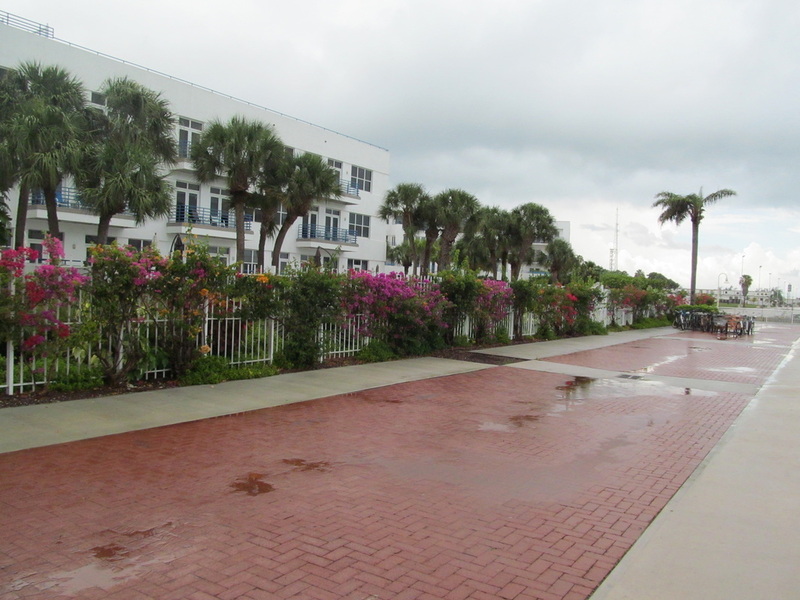 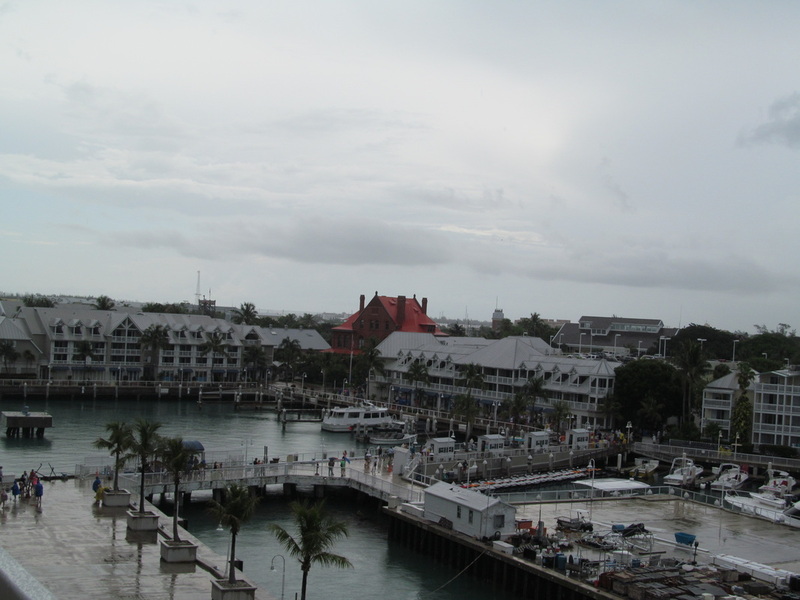 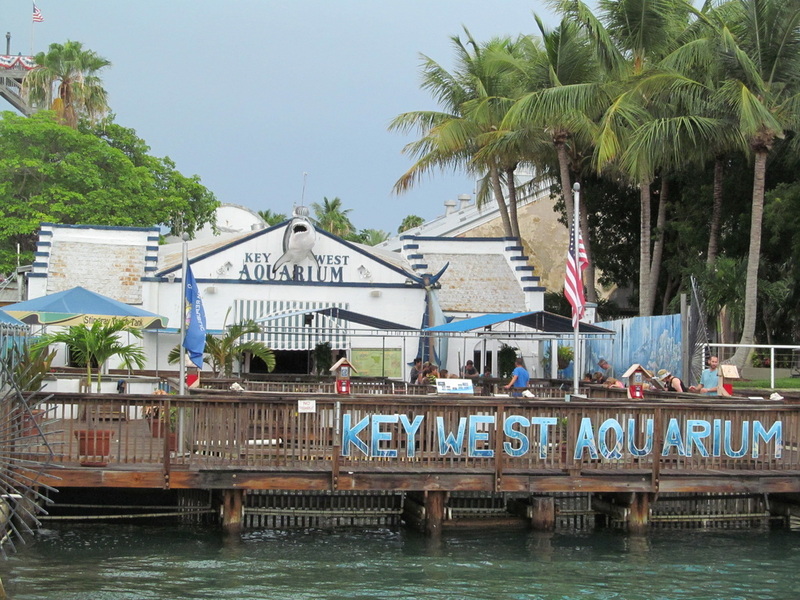 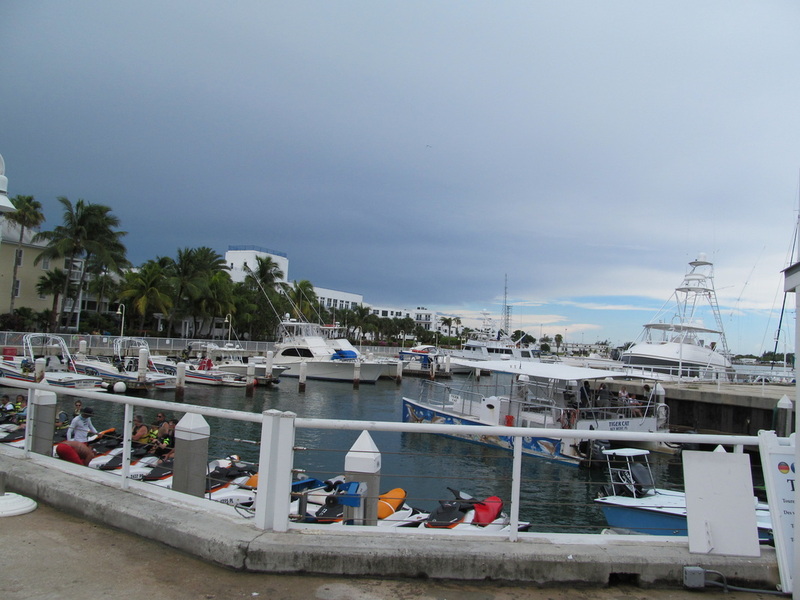 Overview: Today was the first port of call of the cruise - Key West, Florida. 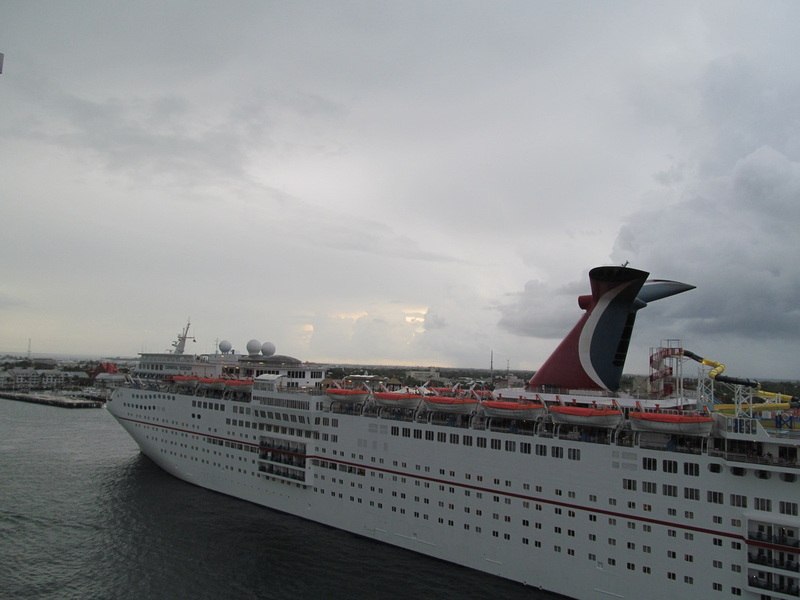 I woke up early to walk around the ship and to get to the front of the ship to watch it dock. 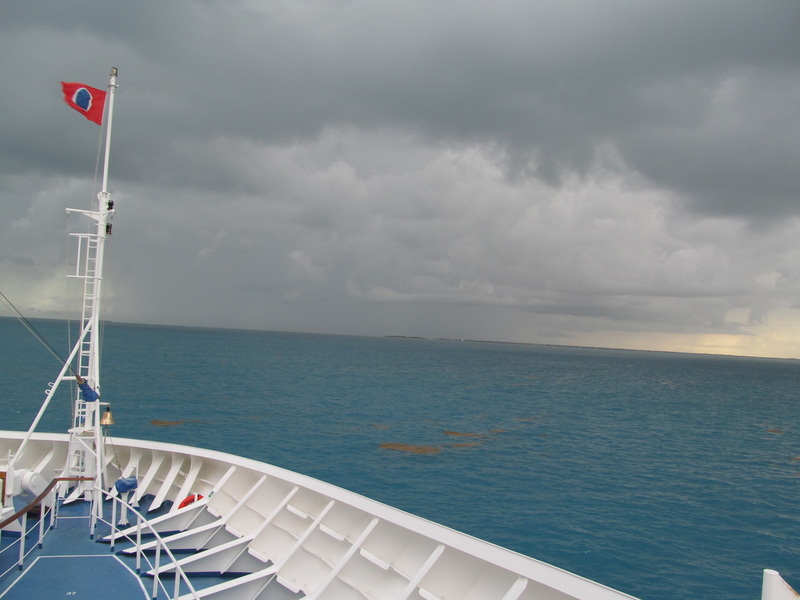 However, the weather was not very good on this day.It rained almost all morning. 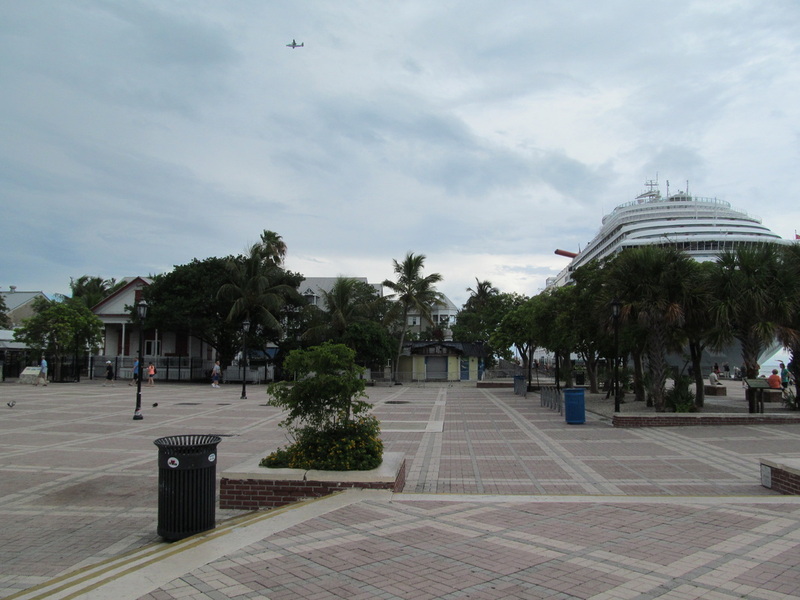 Today's review is in two parts. 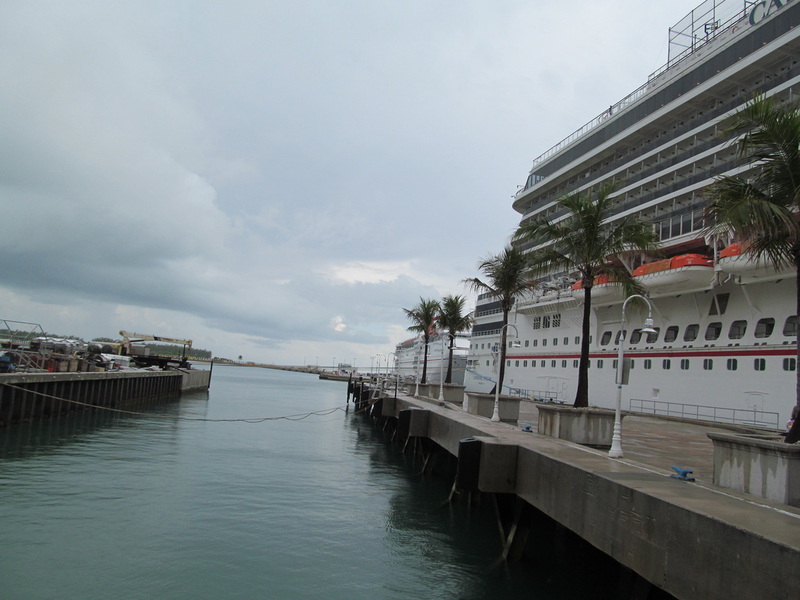 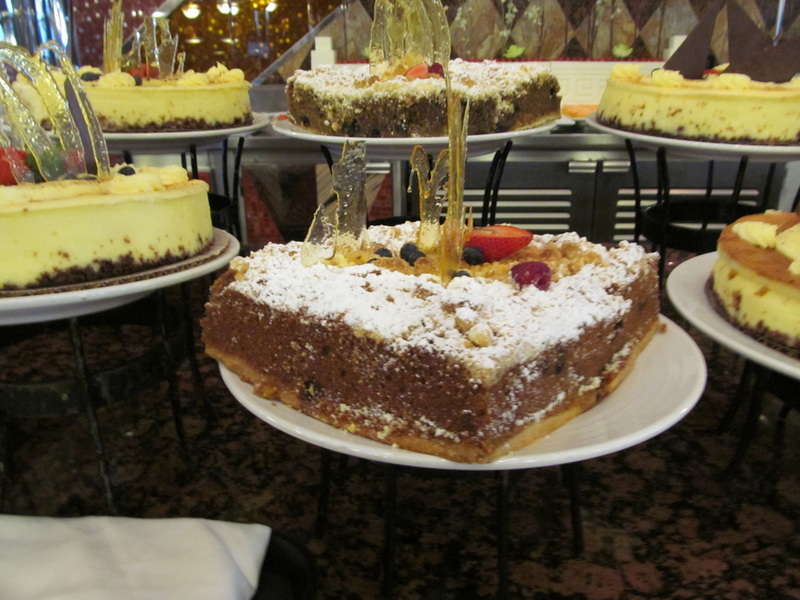 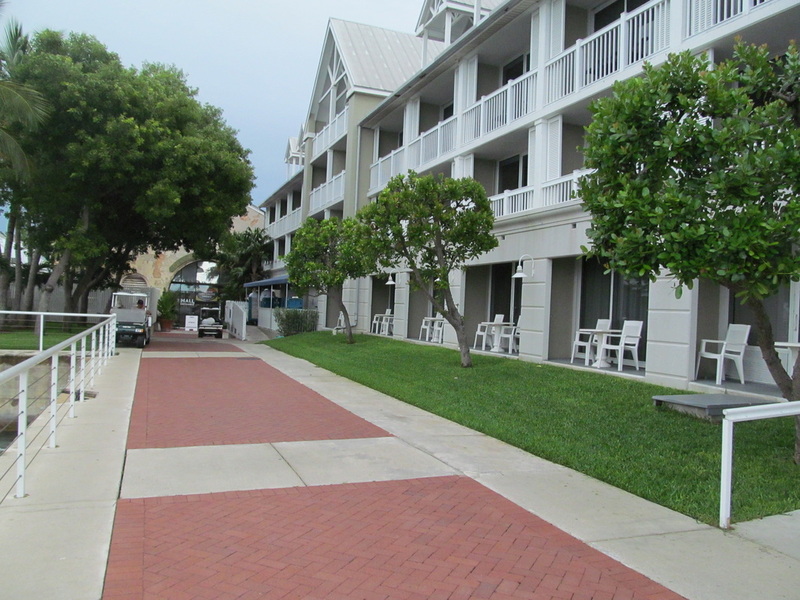 Part one of the review will include some morning photos around the ship, Key West photos, and lunch buffet photos. 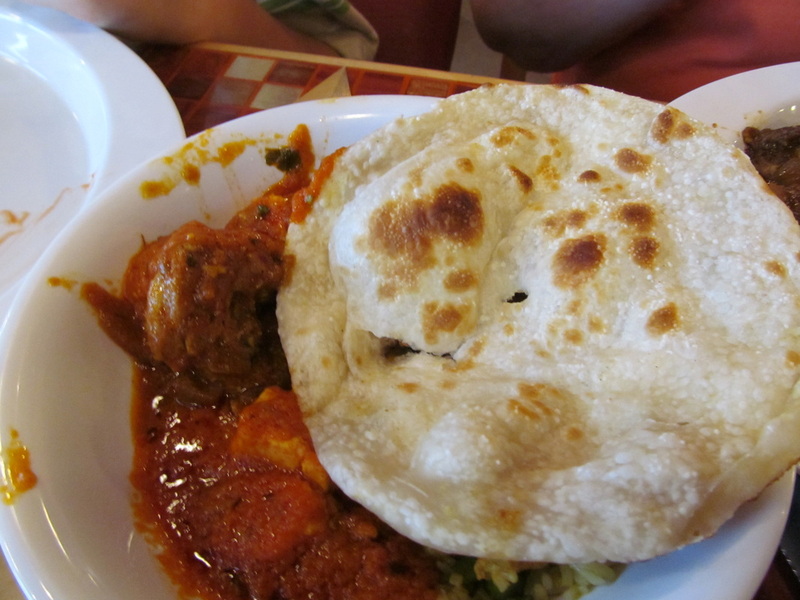 I have included more lunch photos on today's review than the other parts of the review so far. 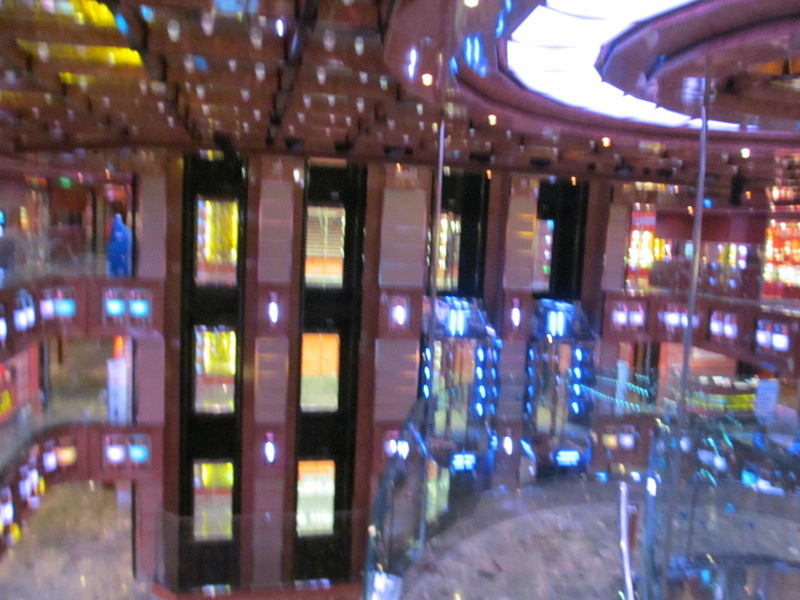 I took some stairs in the atrium to go down from Deck 5 to Deck 3. 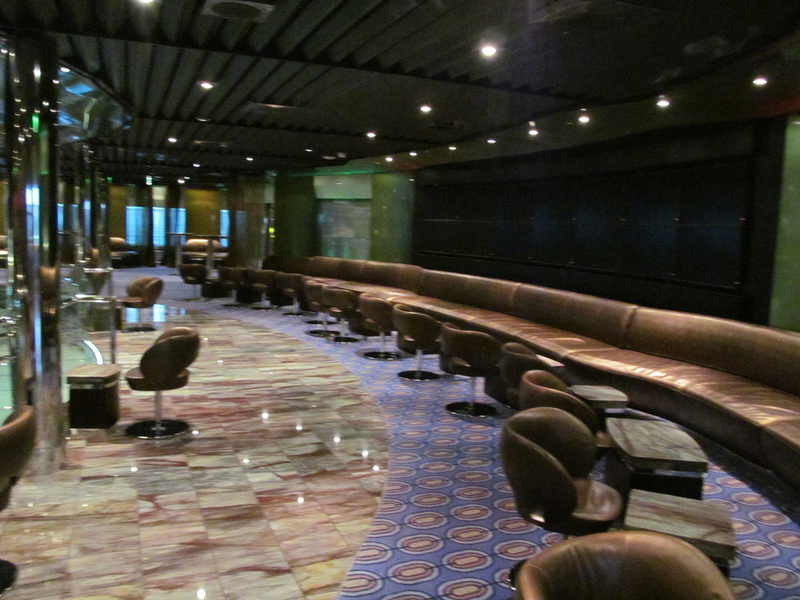 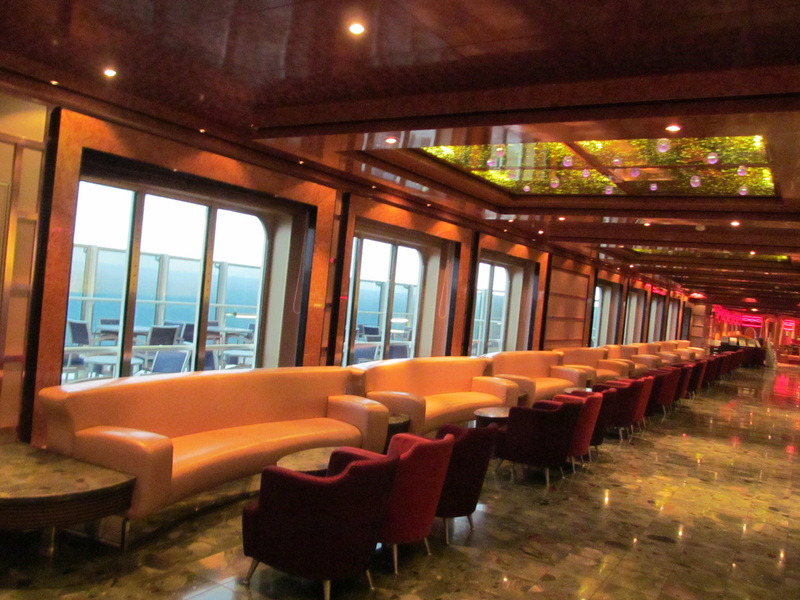 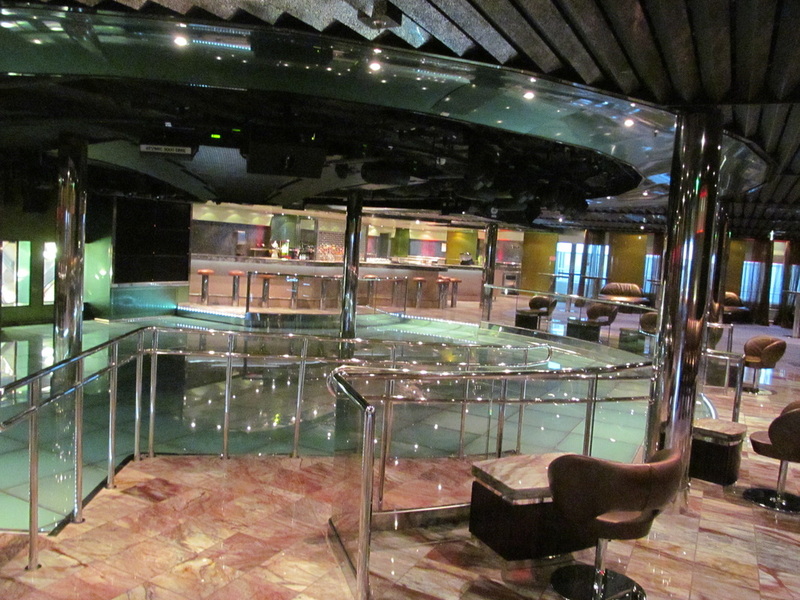 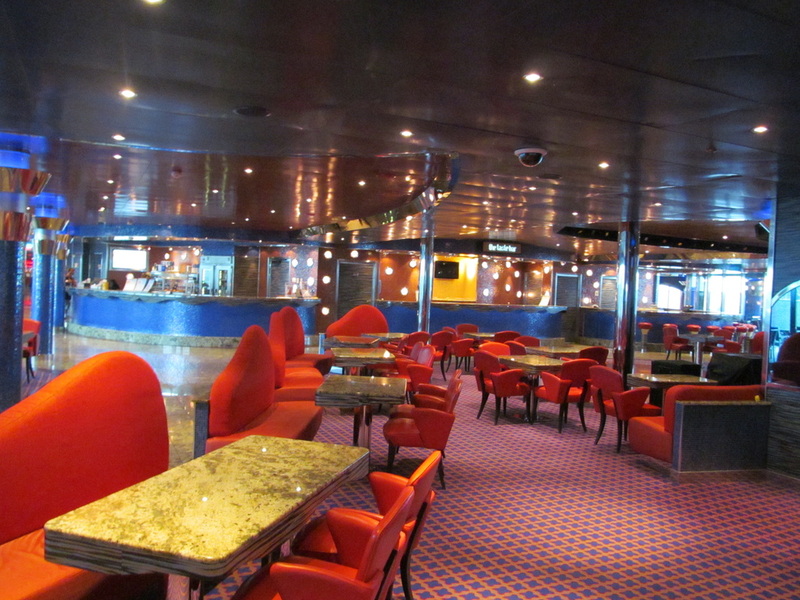 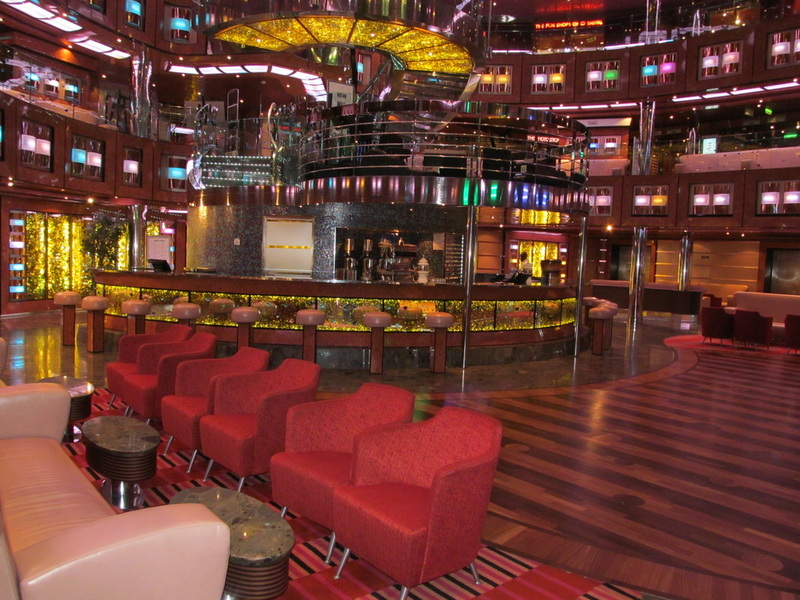 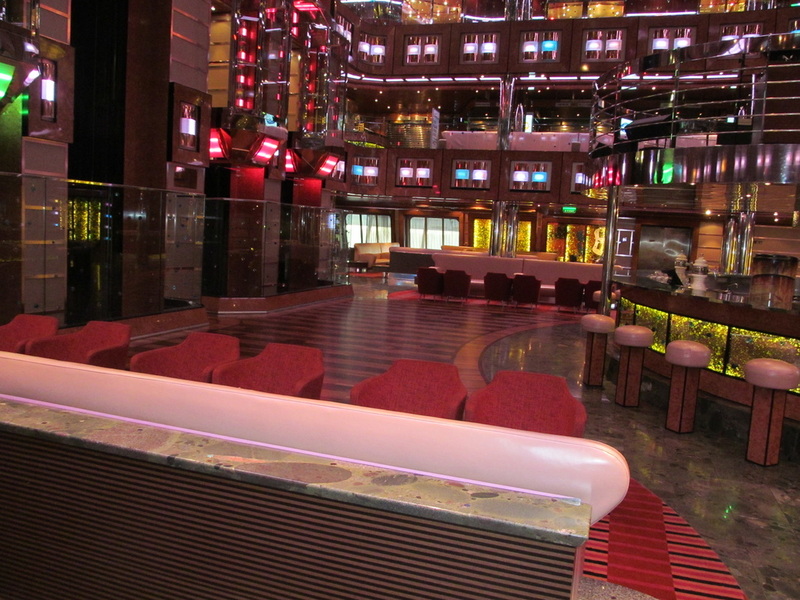 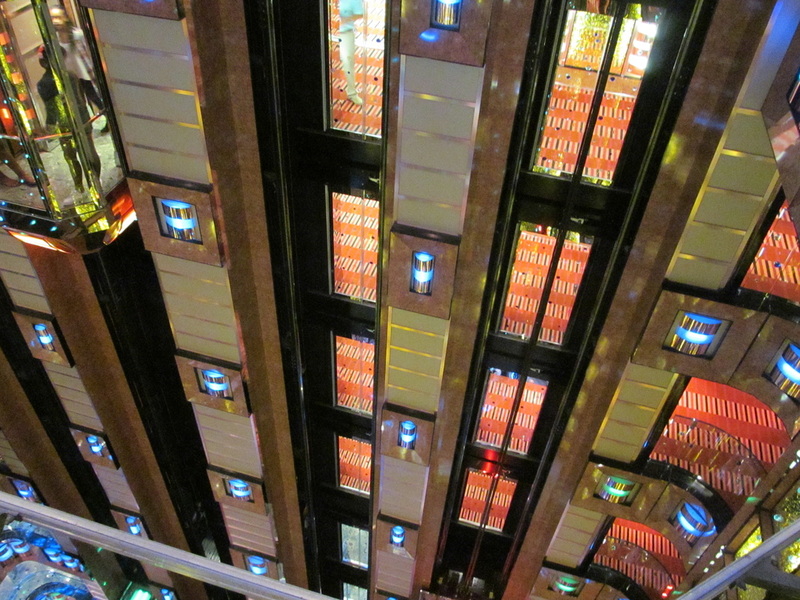 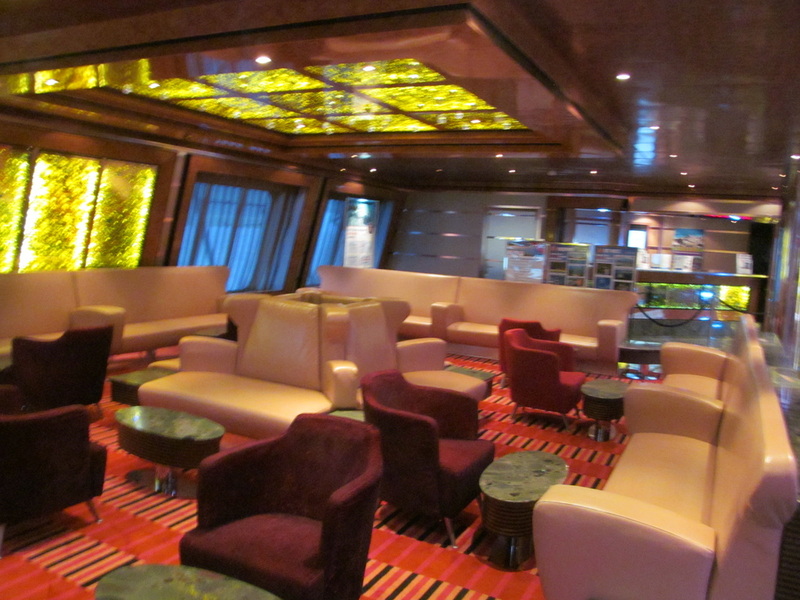 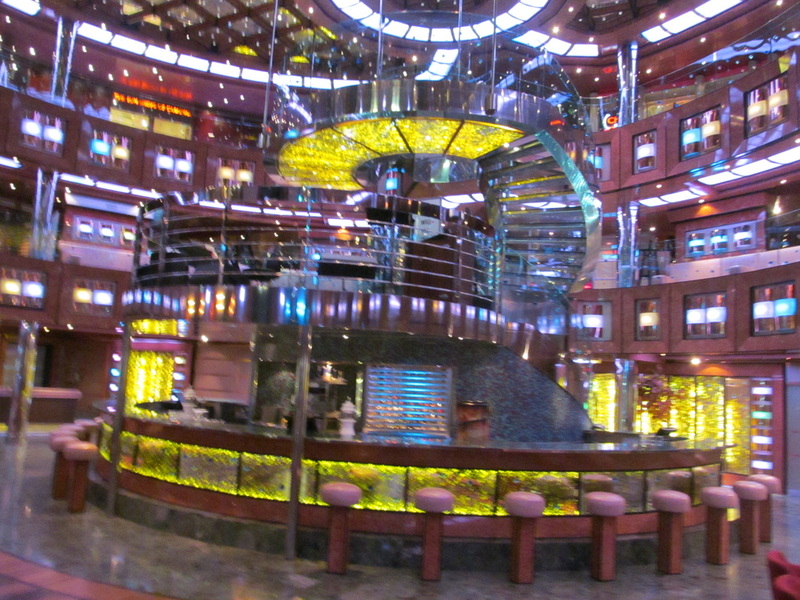 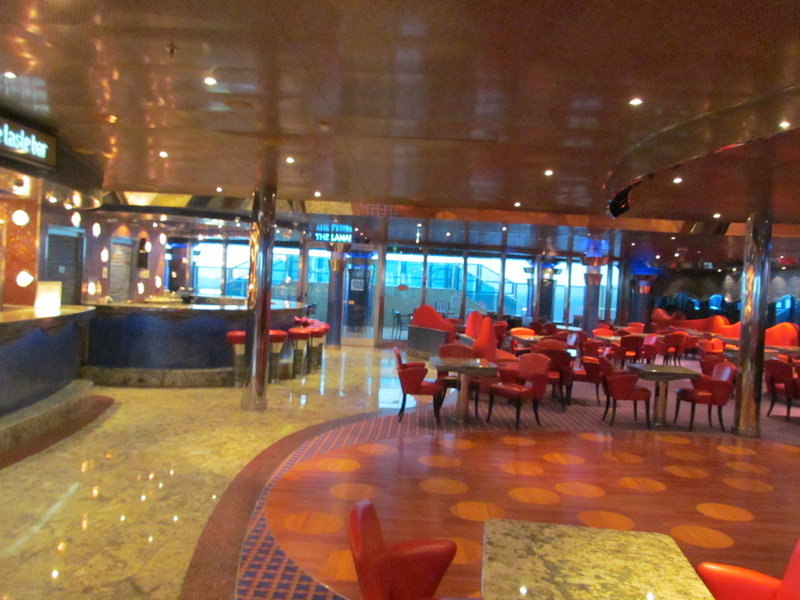 Deck 3 is the lowest level of the atrium and is home to the Guest Services desk & Shore Excursions desk. 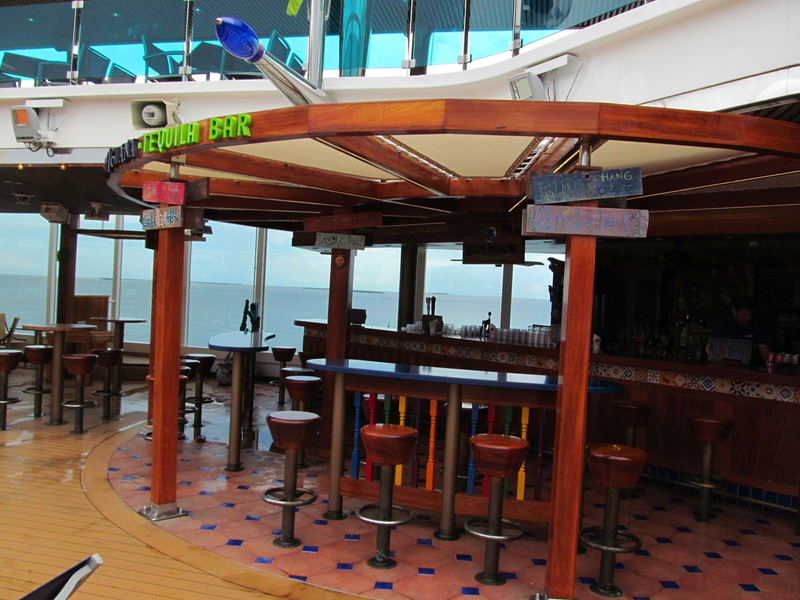 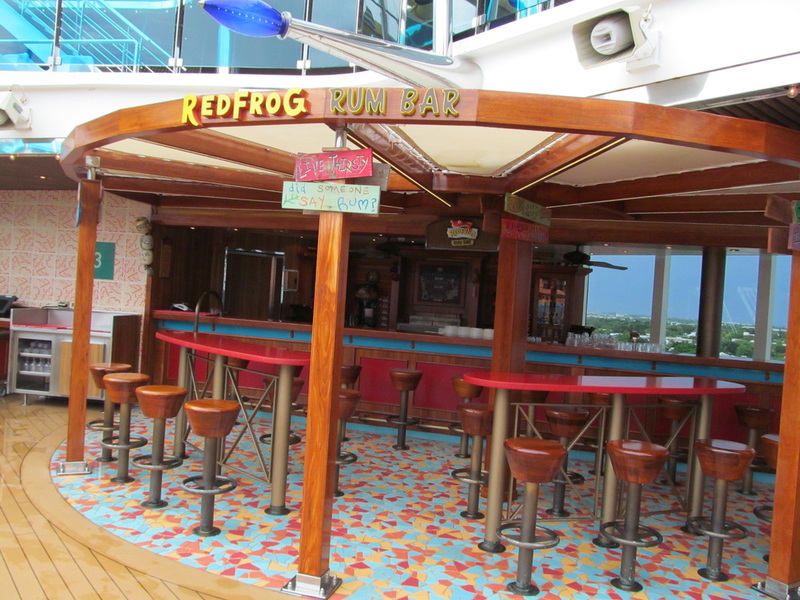 There is a bar in the atrium and many different areas to sit along the edges of the atrium. 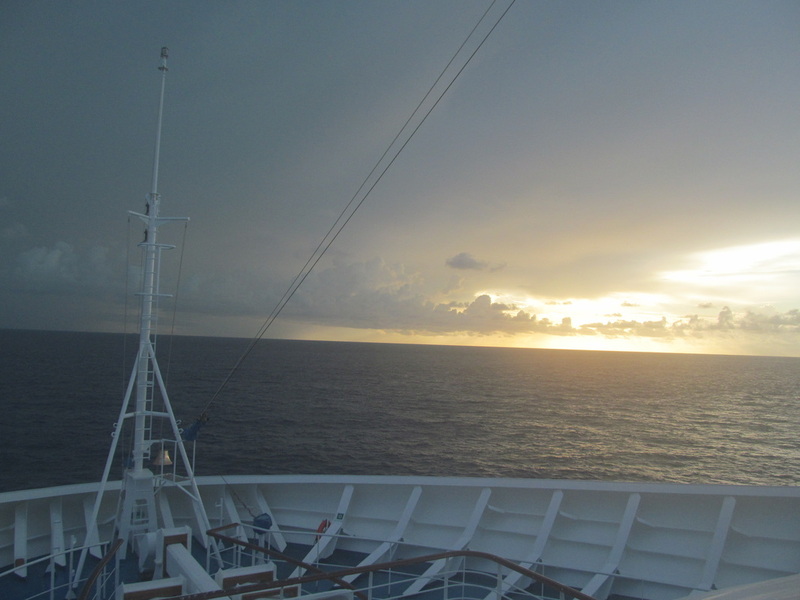 The rain is coming towards us and we going towards it. 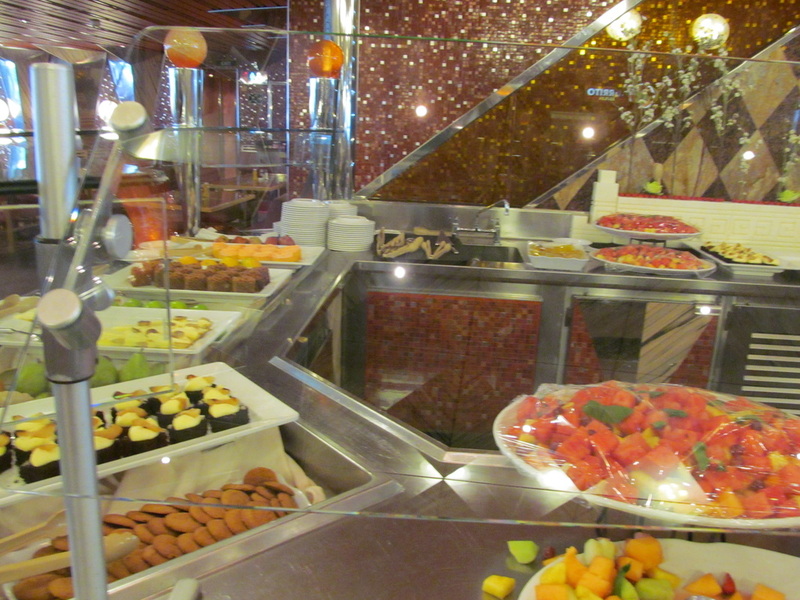 Once again I ate breakfast in The Gathering. 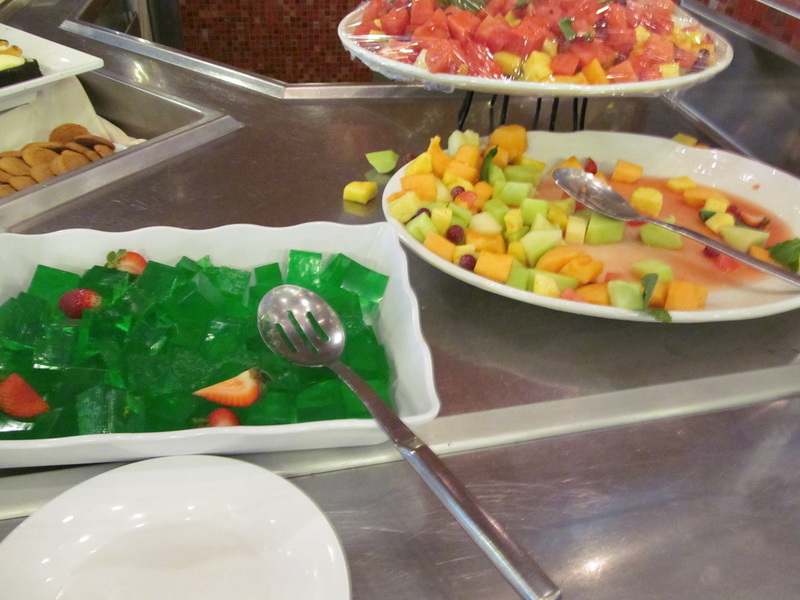 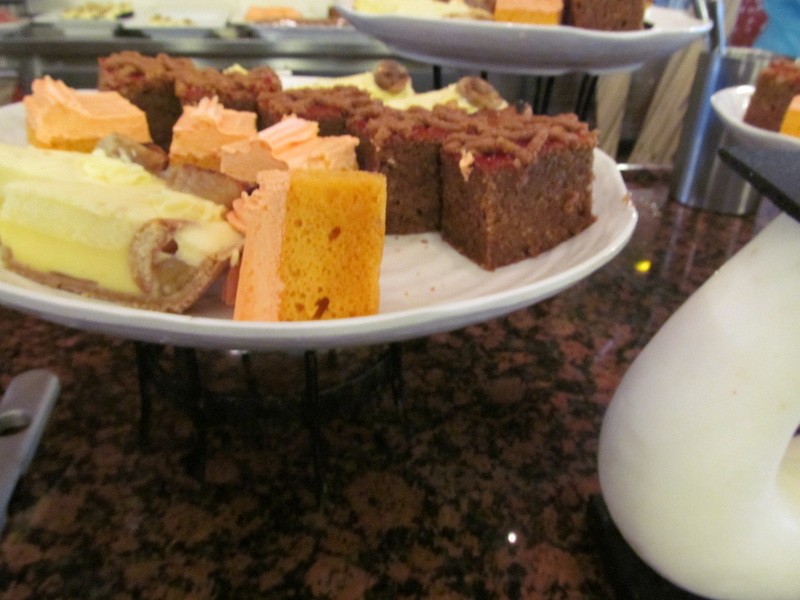 The continental breakfast lines opened around 6:00am and the general breakfast buffet lines opened around 7:00am. 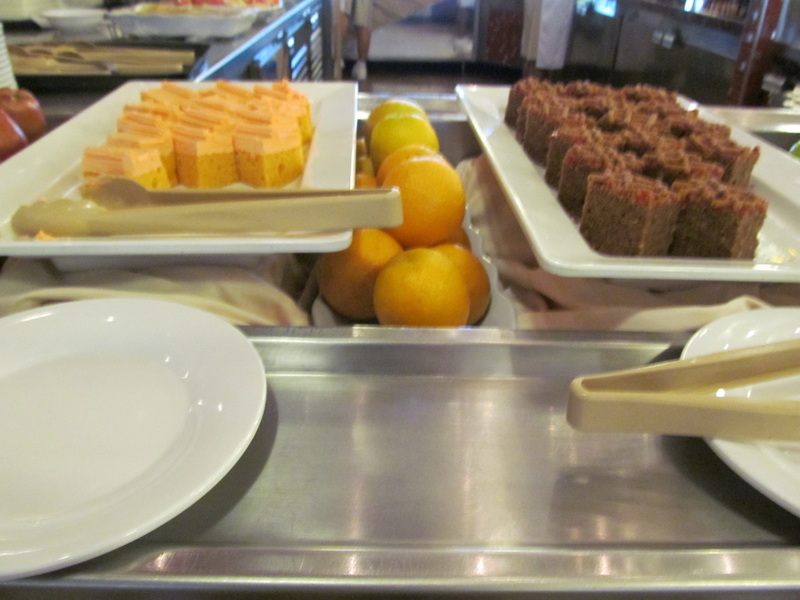 Breakfast was also being served in the Scarlet Dining Room from 7:00am to 9:00am. 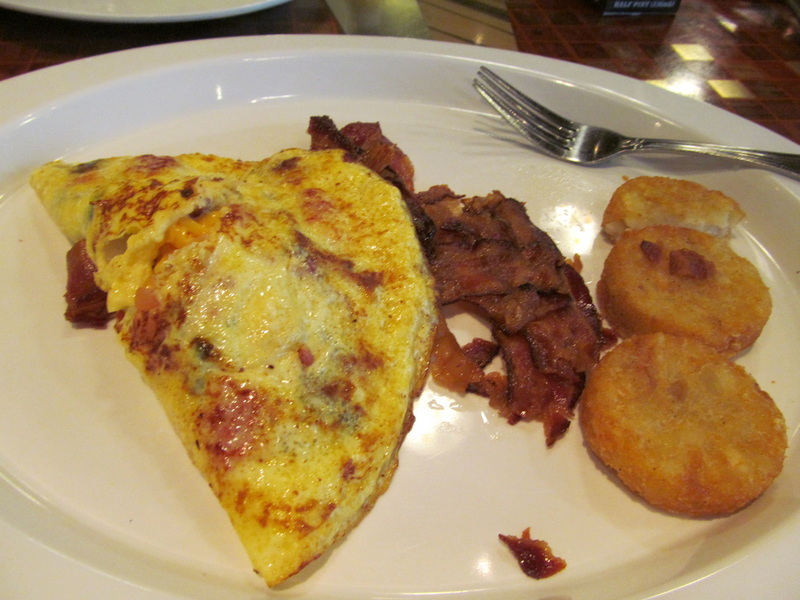 I had an omelet, bacon, and hash browns. 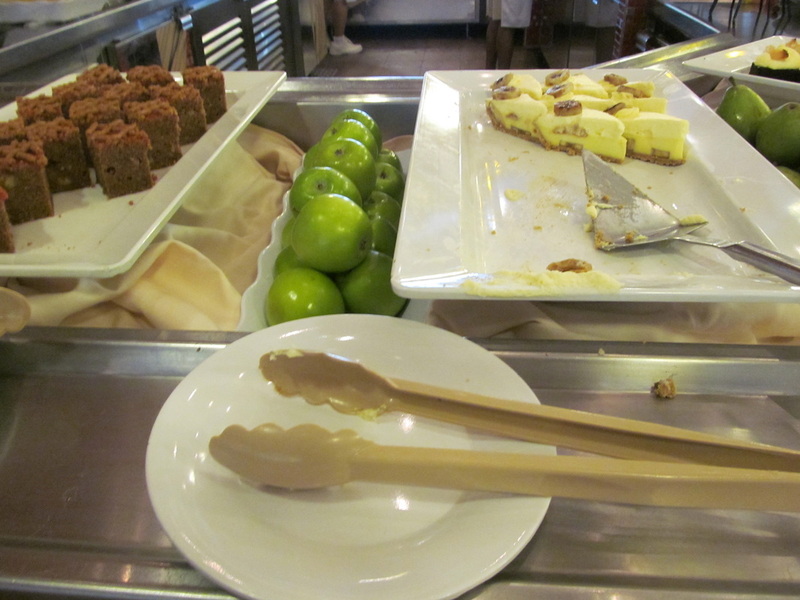 The omelet lines were long again today, but the omelet was worth the wait. 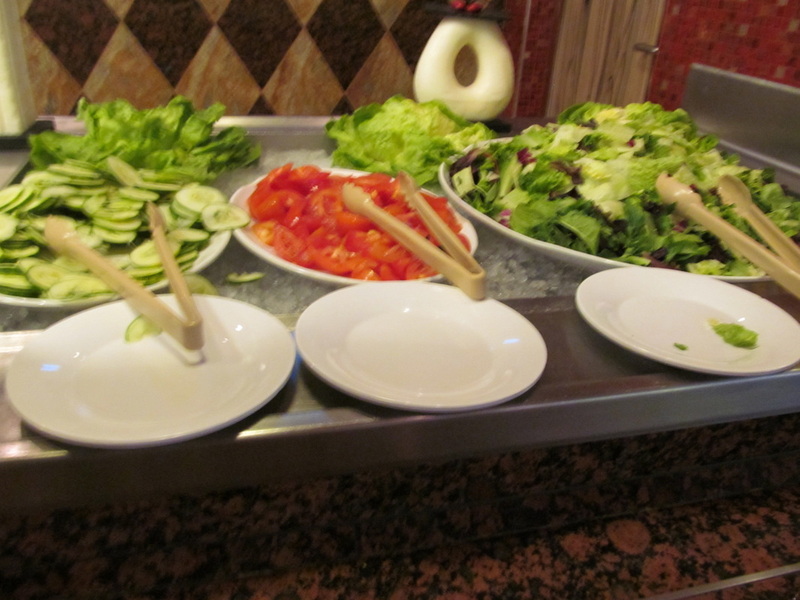 There are a variety of toppings that you can choose to put in your omelet such as ham, cheese, onions, mushrooms, tomatoes, bacon, and other mixed vegetables. 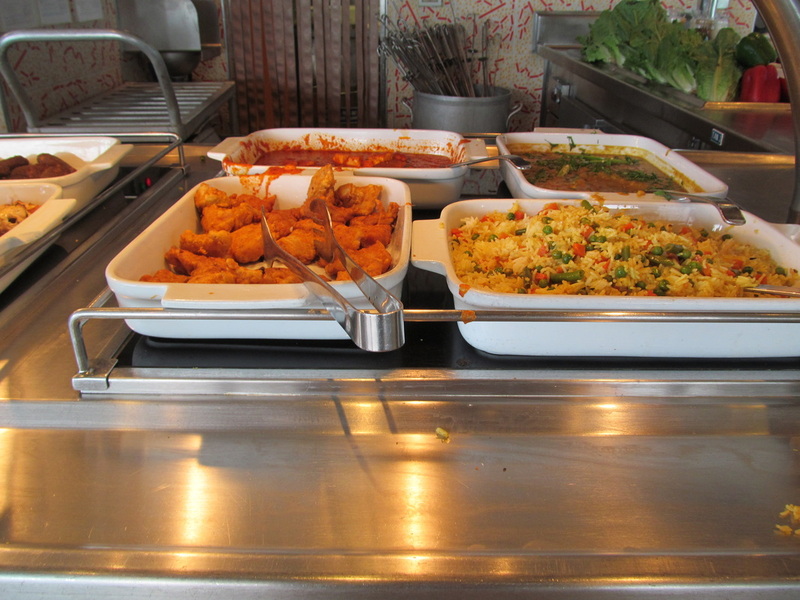 The bacon and hash browns were also good. 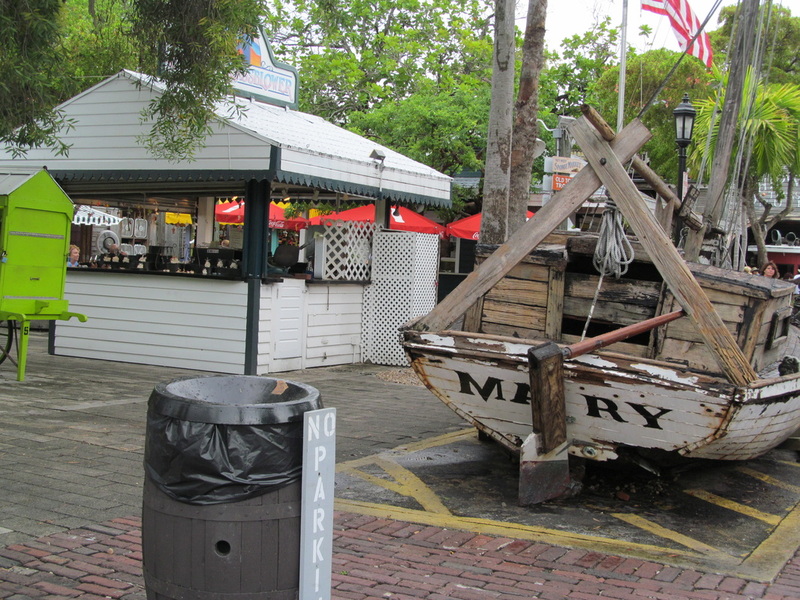 The bacon was greasy (it always was each day) and it was rationed again. 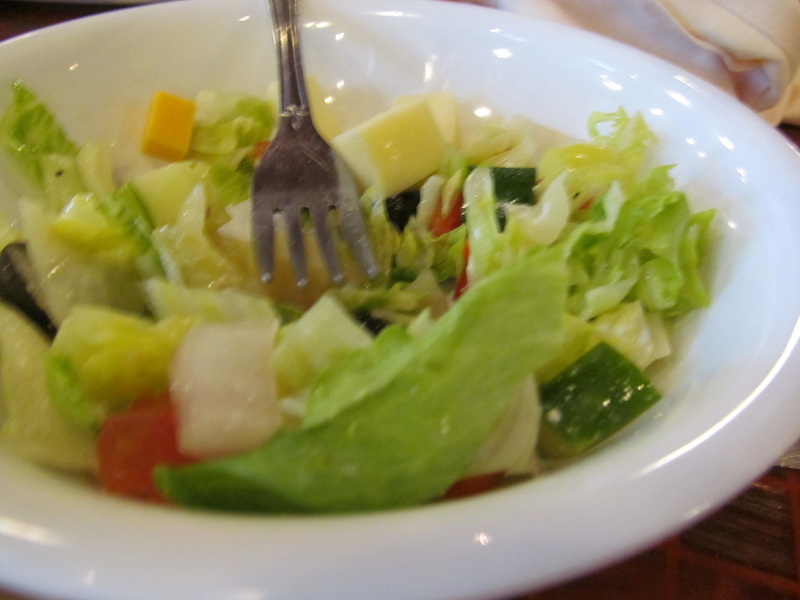 Today I had a server that was very generous and gave me about 5 pieces to start with. 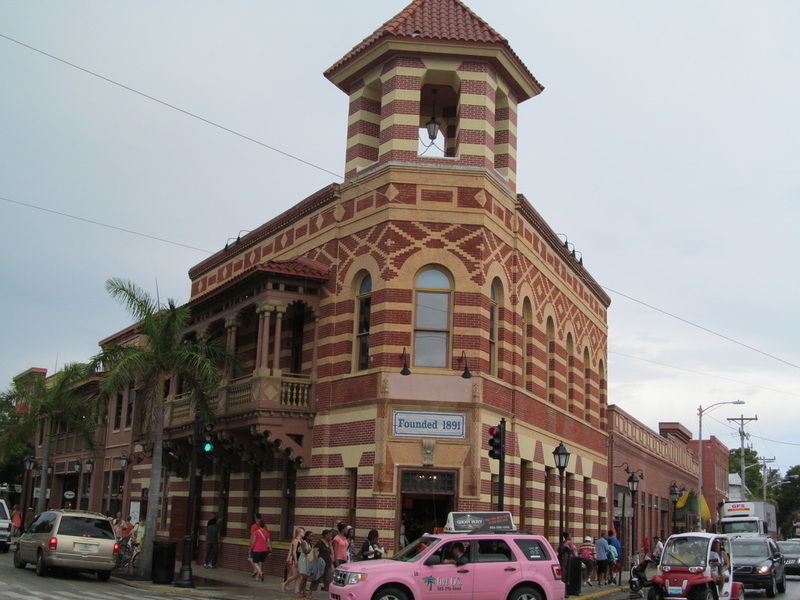 If you are very friendly to the bacon server and want a lot of bacon they will probably be more inclined to give you more. 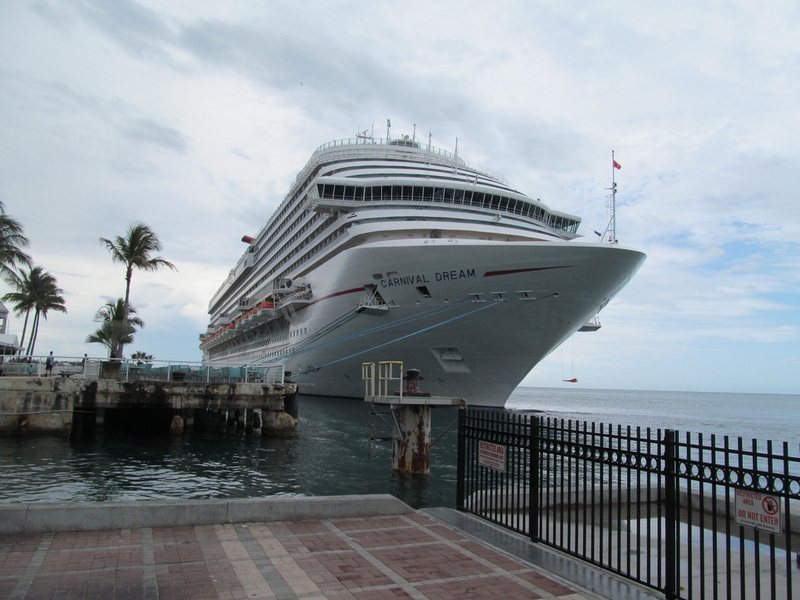 The Carnival Dream docked at a separate pier that was very close to another pier where the Carnival Ecstasy was docked. 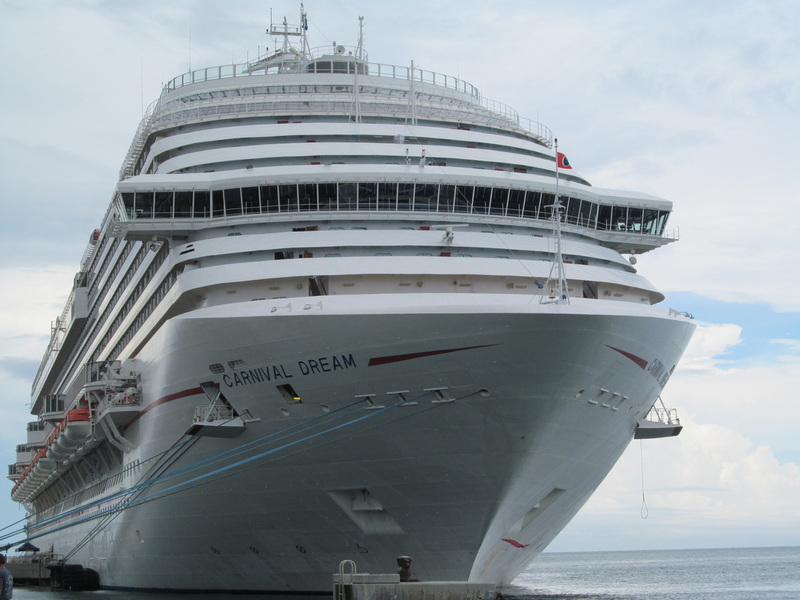 The Carnival Ecstasy was the first cruise ship that I ever cruised on and it is responsible for starting my cruise addiction. 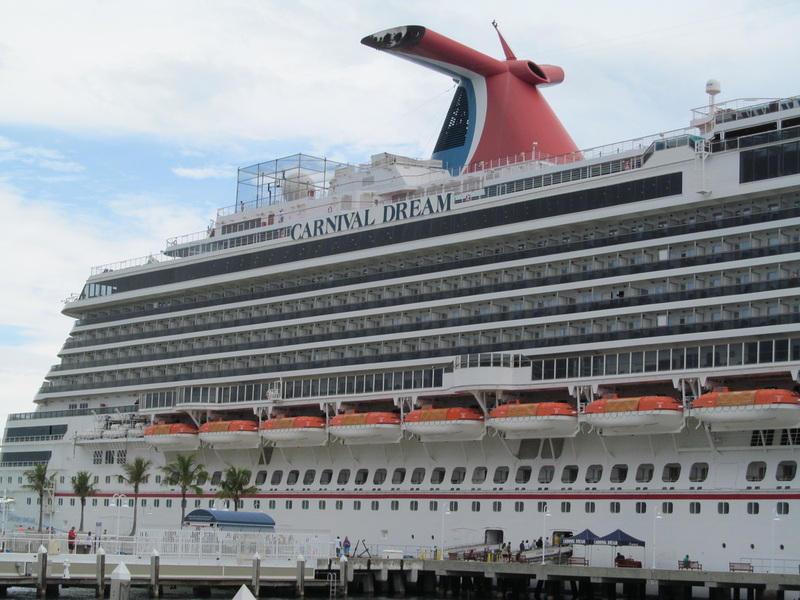 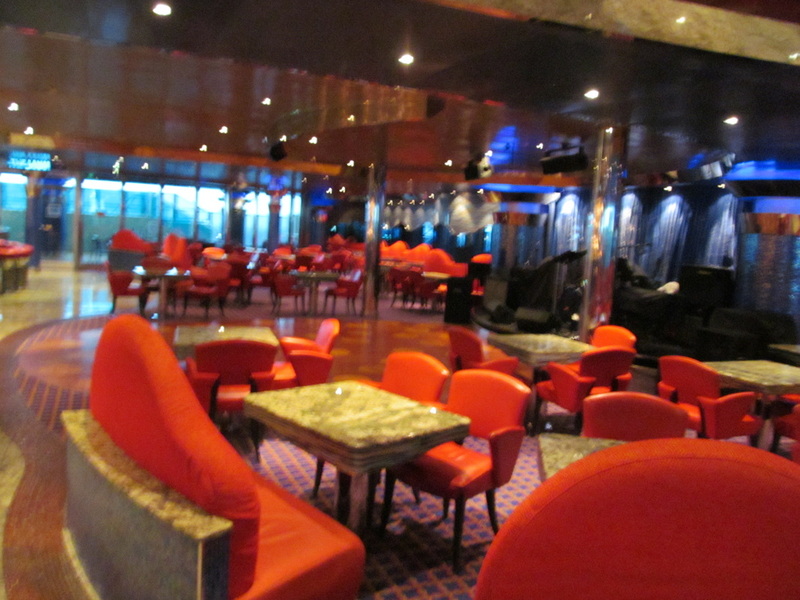 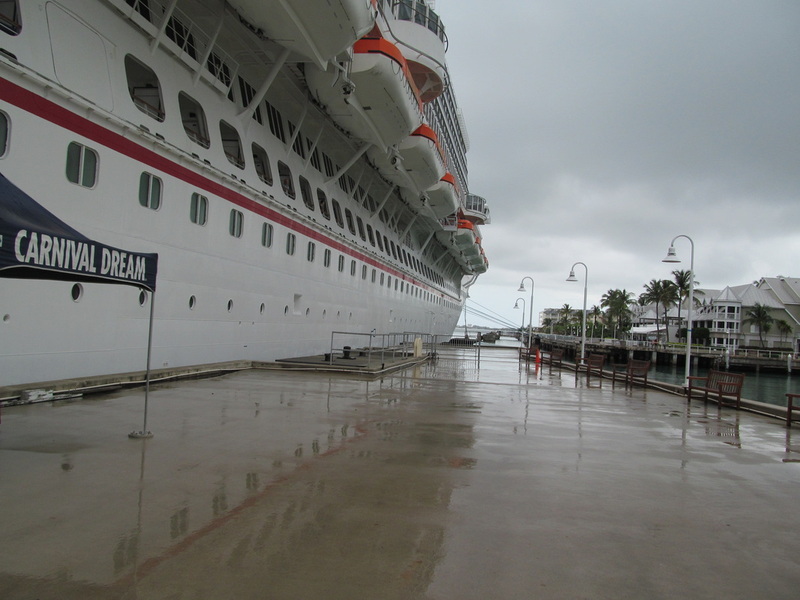 I first cruised the Carnival Ecstasy in 2007 and cruised again many more times on the Carnival Ecstasy after that. 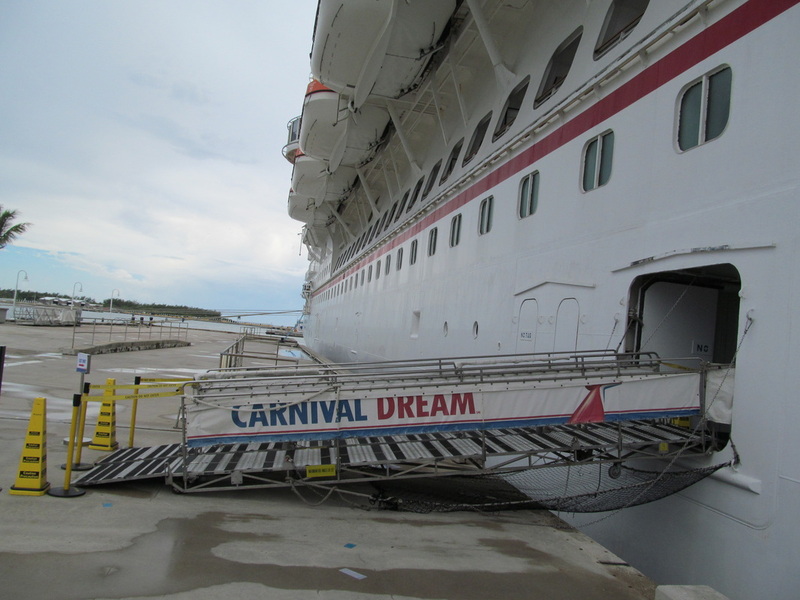 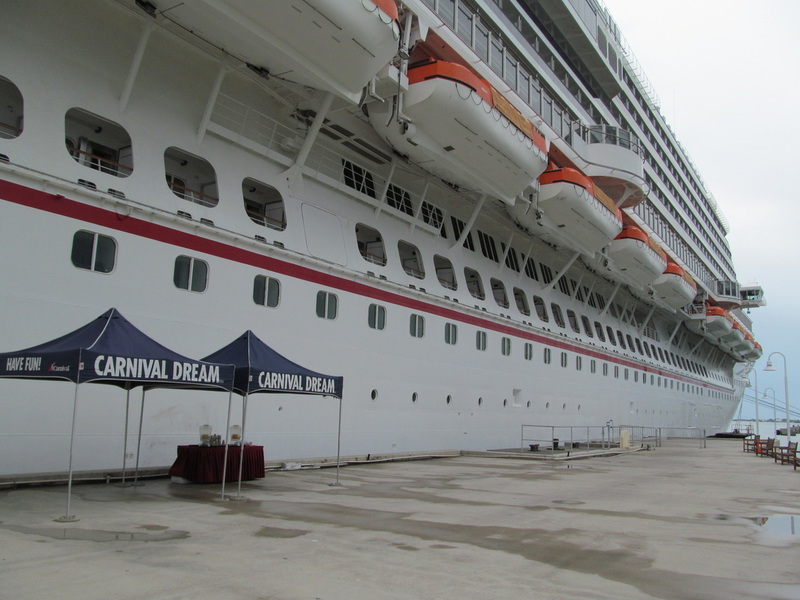 The last time I cruised on the Carnival Ecstasy was in June 2011, a few months before the ship got re-positioned from Galveston to Port Canaveral. 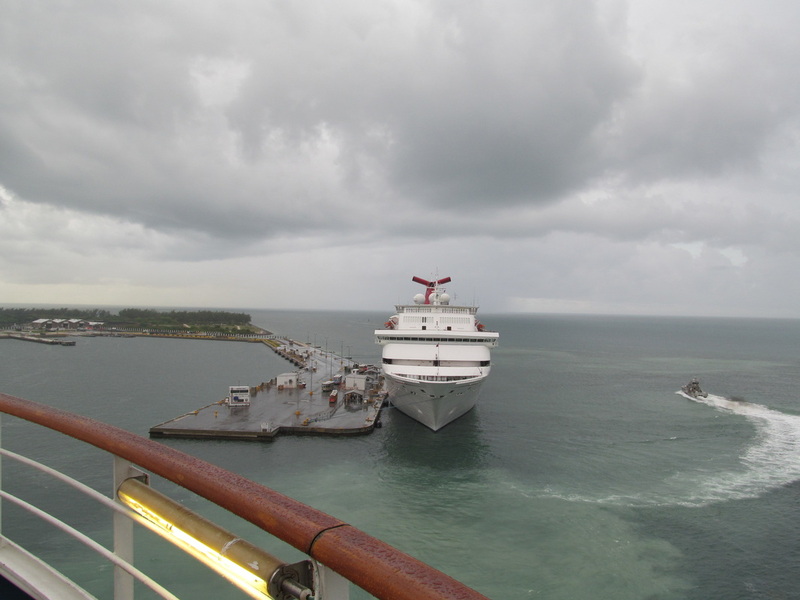 Since then the ship has been re-positioned from Port Canaveral to Miami, Florida. 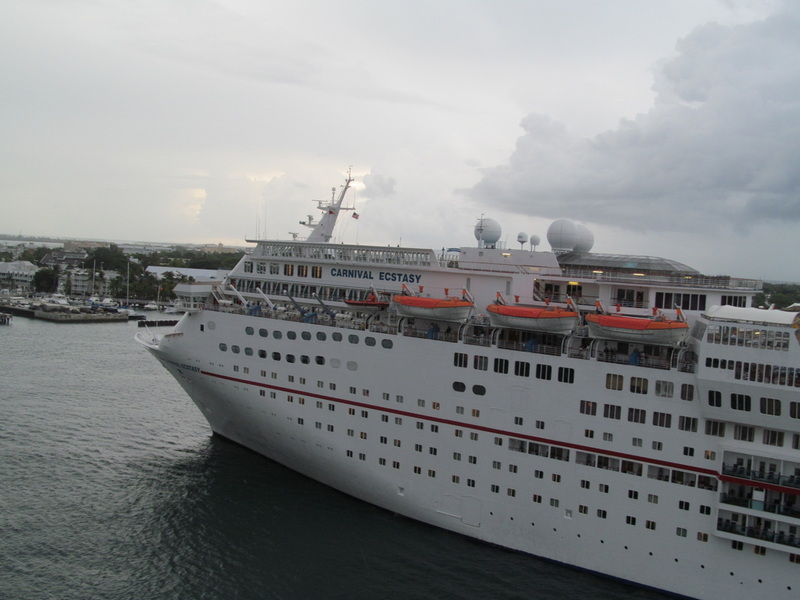 It was great to see the ship and many memories got brought back from my past cruises. 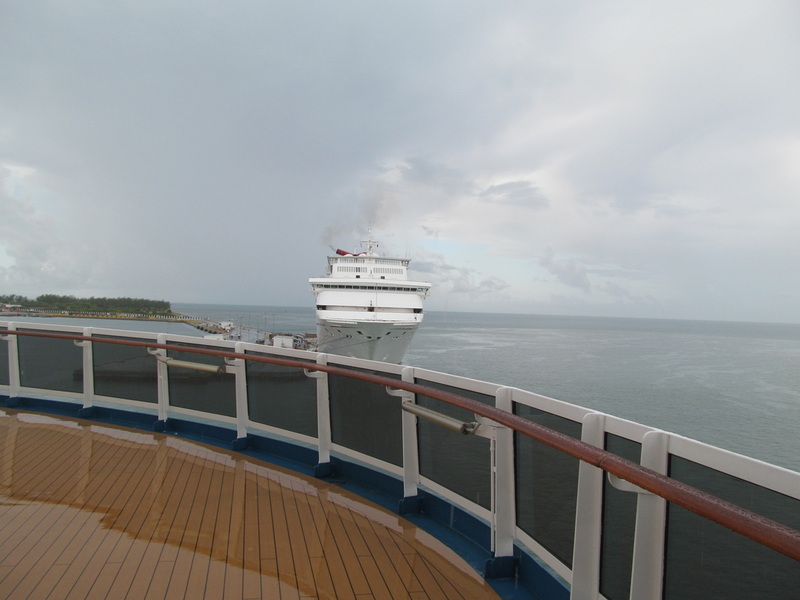 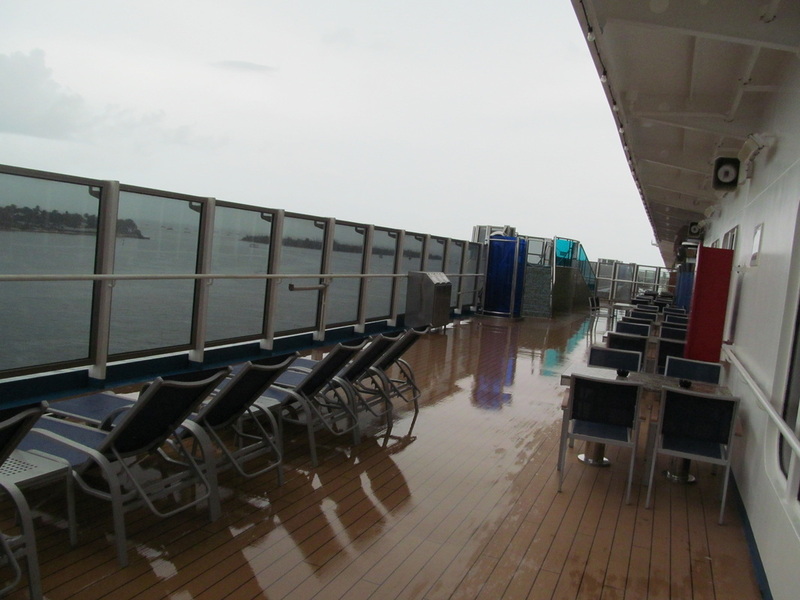 It was still raining while the ship was docking, but that didn't stop me from going outside. 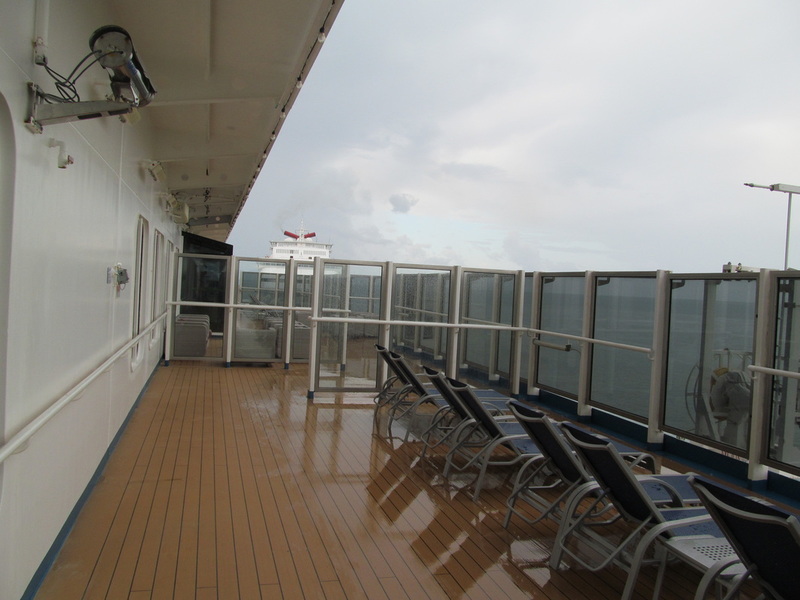 I stayed under the balconies above the Lanai for some protection from the rain. 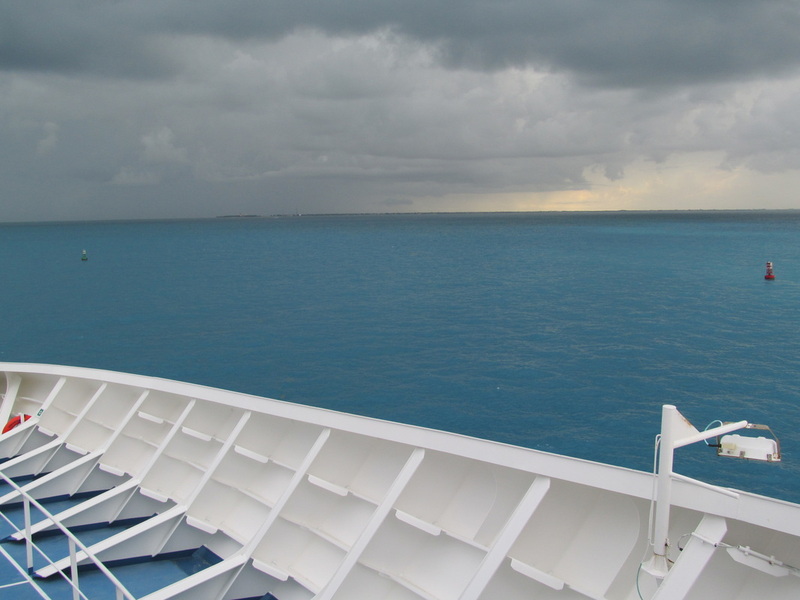 The rain was no longer pouring, but it was still bad enough that most people were not going ashore. 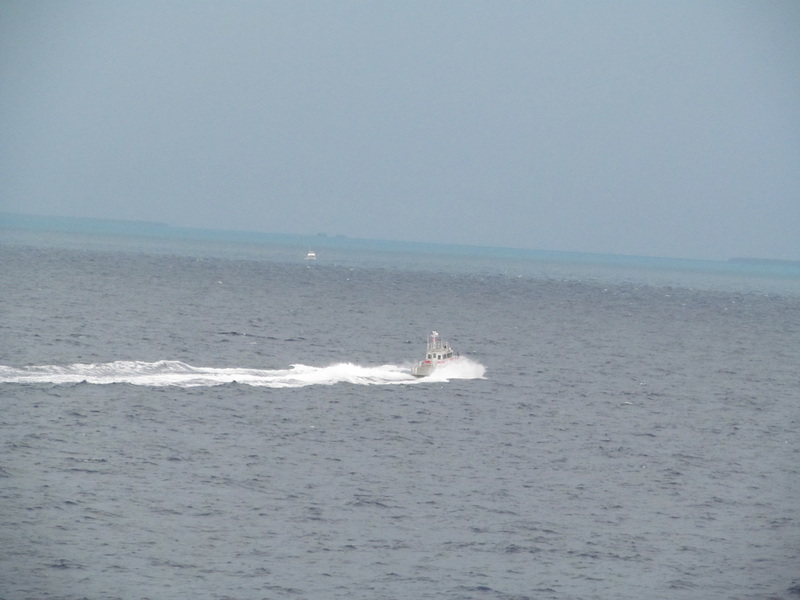 When I walked into my stateroom to gather my belongings and prepare to go ashore, I was surprised to see a lifeboat in my window. 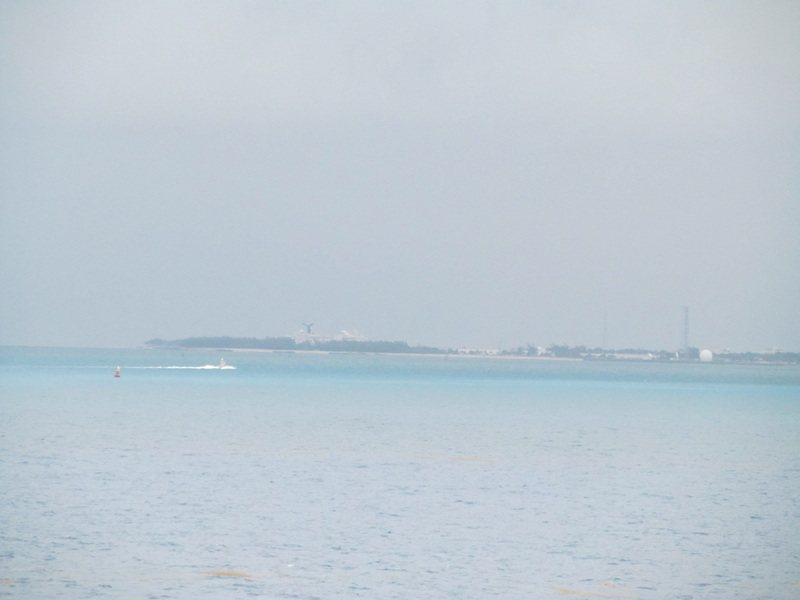 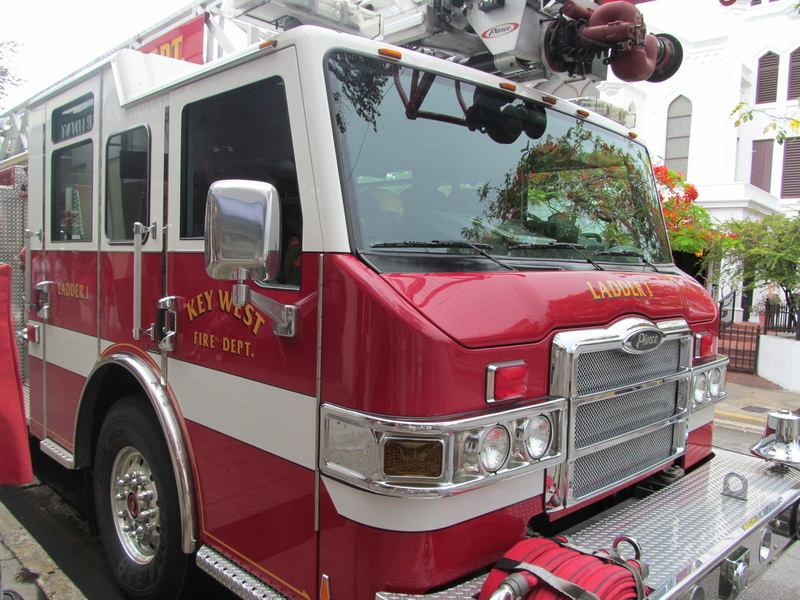 The crew members were testing out the lifeboat and took it for a test drive in the water. 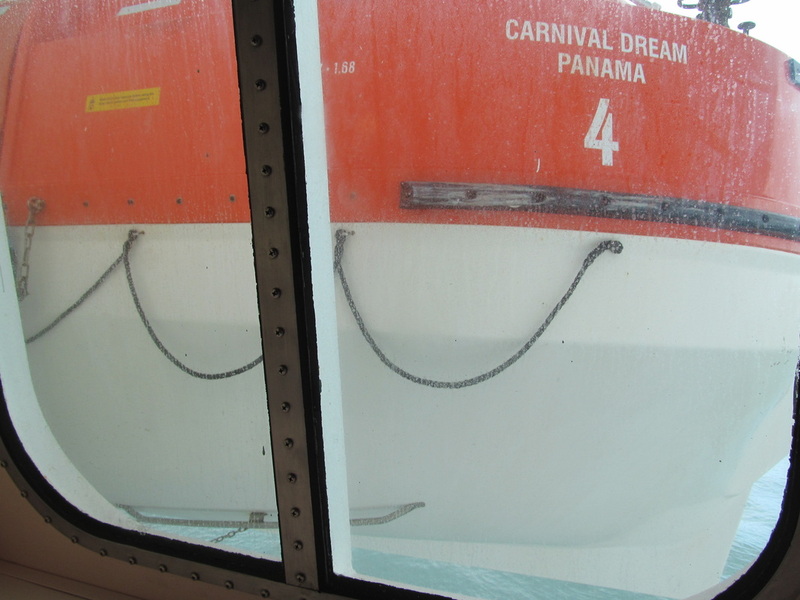 This was interesting to see and made me hope that I never have to get into a lifeboat during a real emergency. 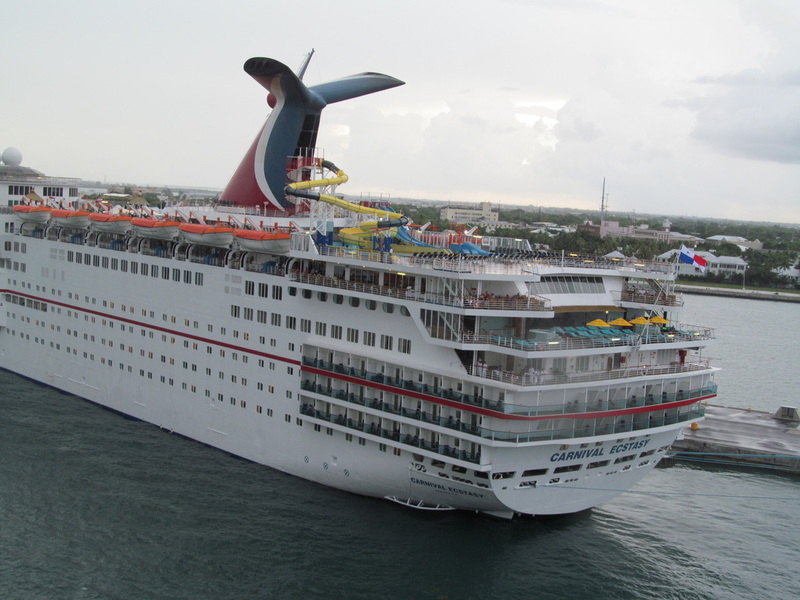 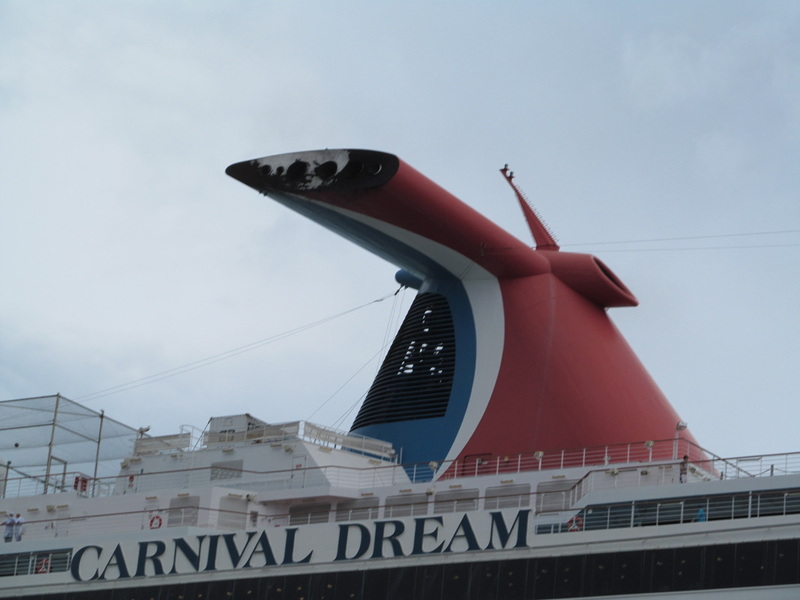 Carnival has made many claims that they prioritize safety and that emergency devices are tested. 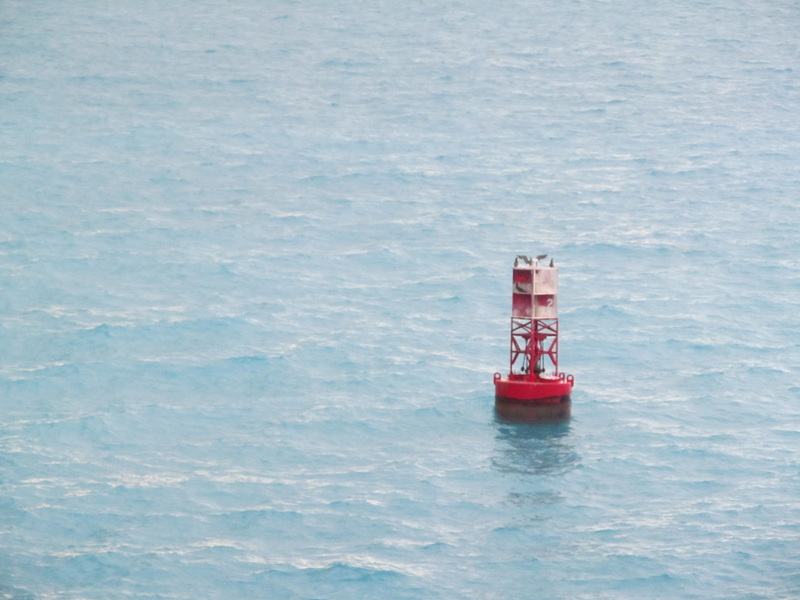 This is a real life example of an emergency device getting tested. 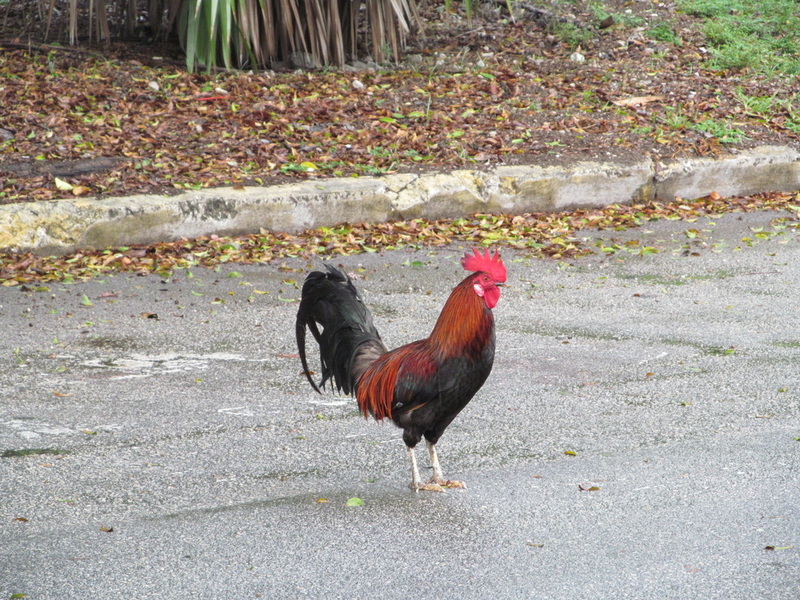 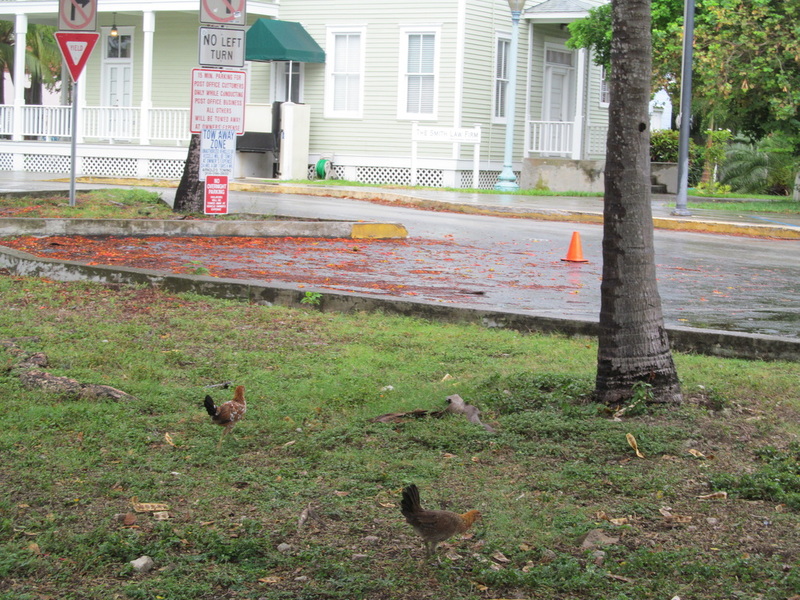 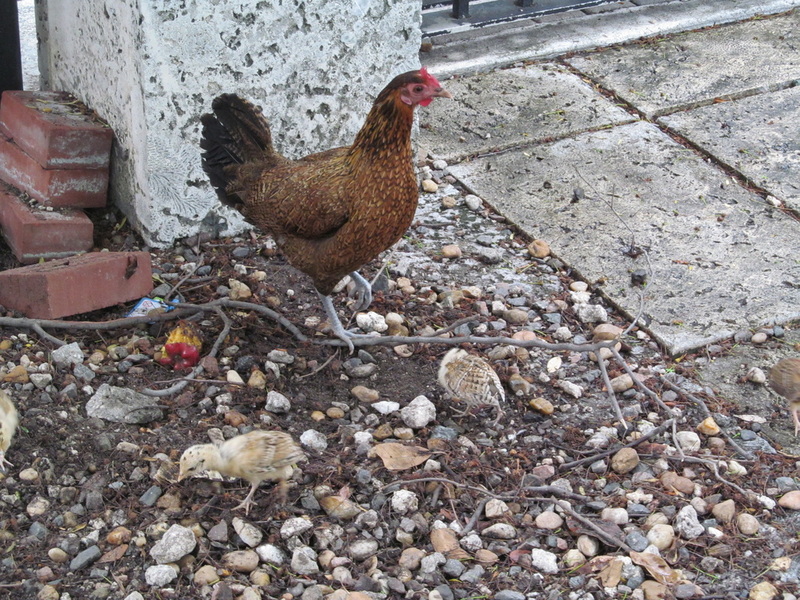 There were many chickens & roosters aimlessly wondering around Key West, Florida. 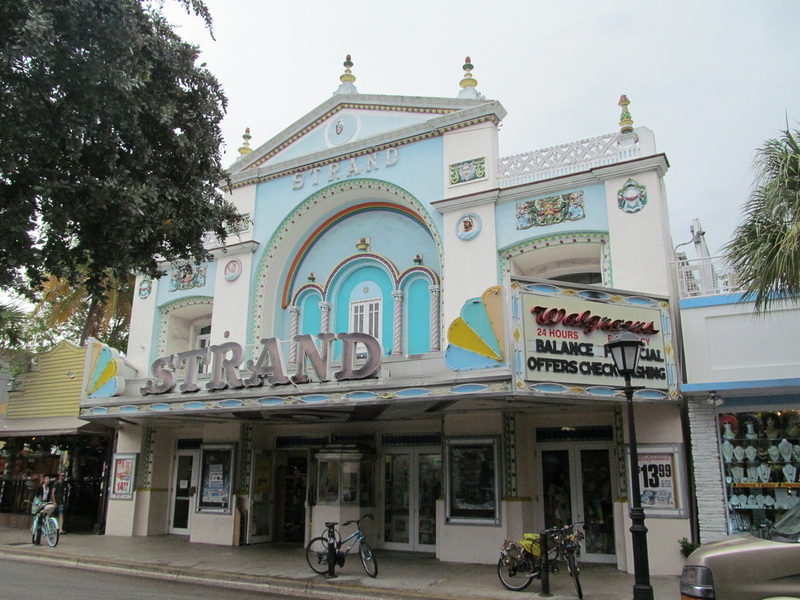 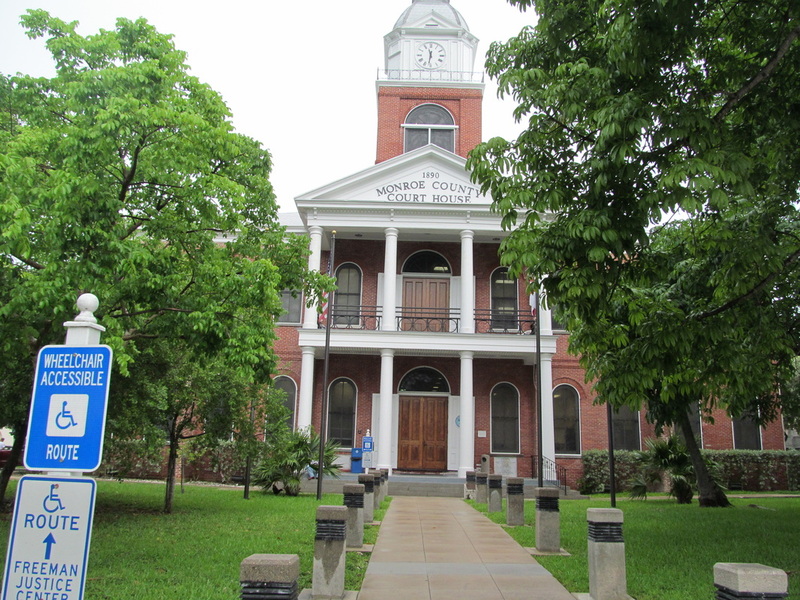 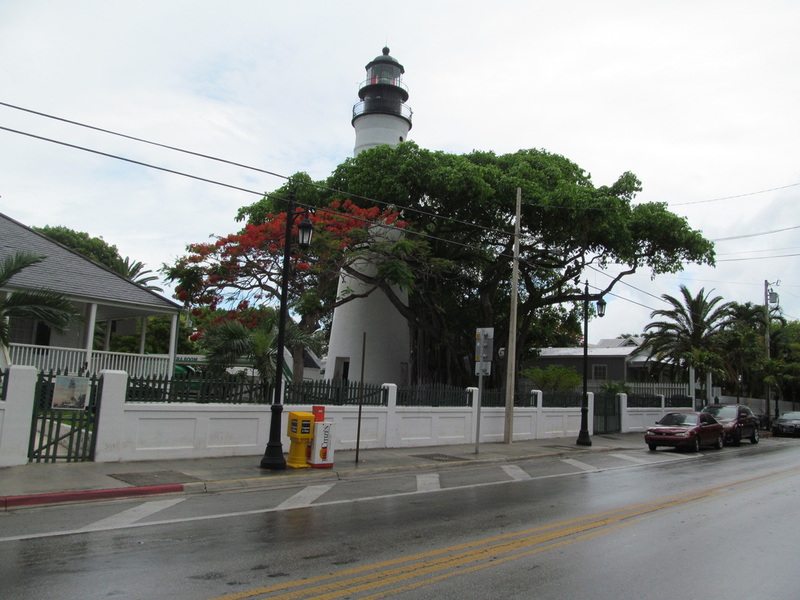 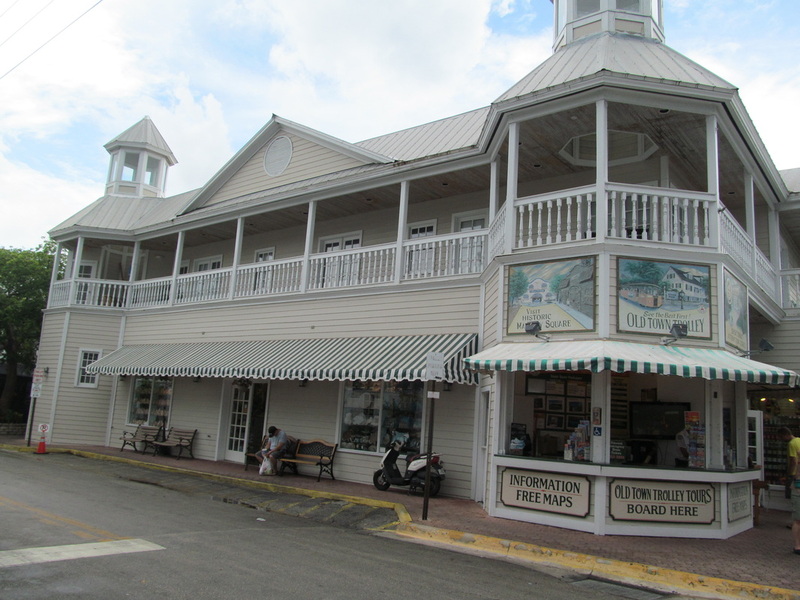 Since Key West is a part of the United States it has its own post office and gets serviced by the USPS (United States Postal Service). 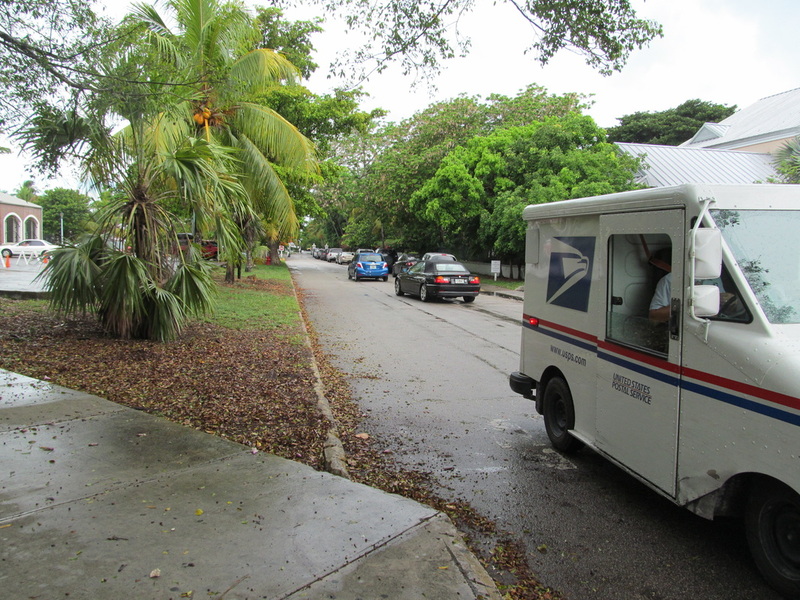 Throughout the day, I saw many different postal trucks making deliveries around the island. 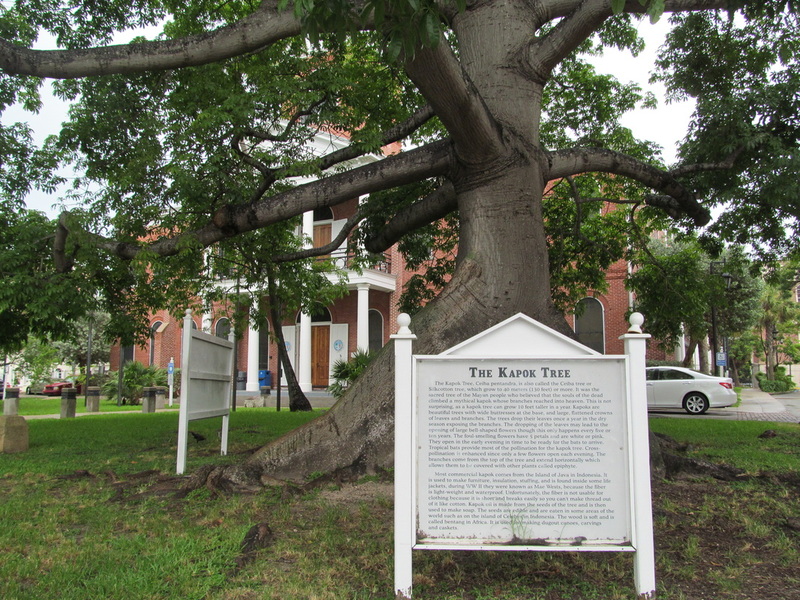 The first picture on the row below is of a bunch of tree roots that I found very interesting. 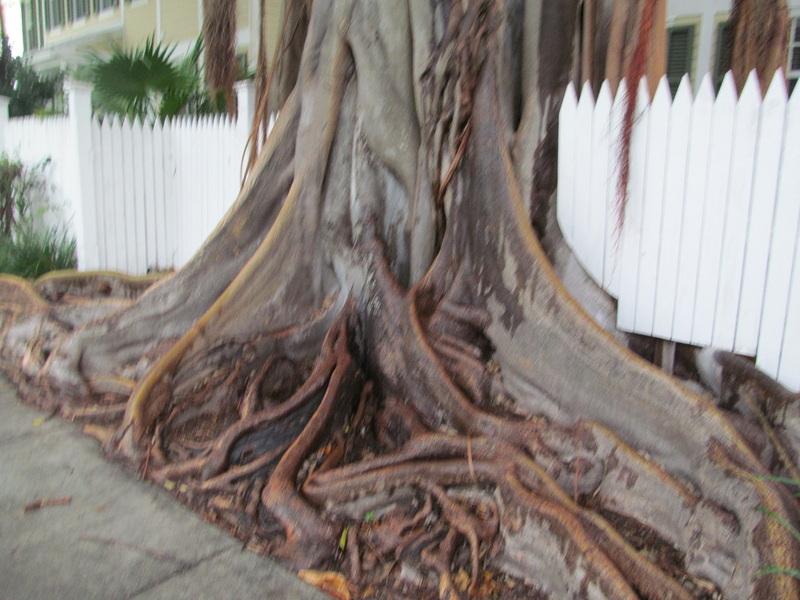 This tree was outside a residential house. 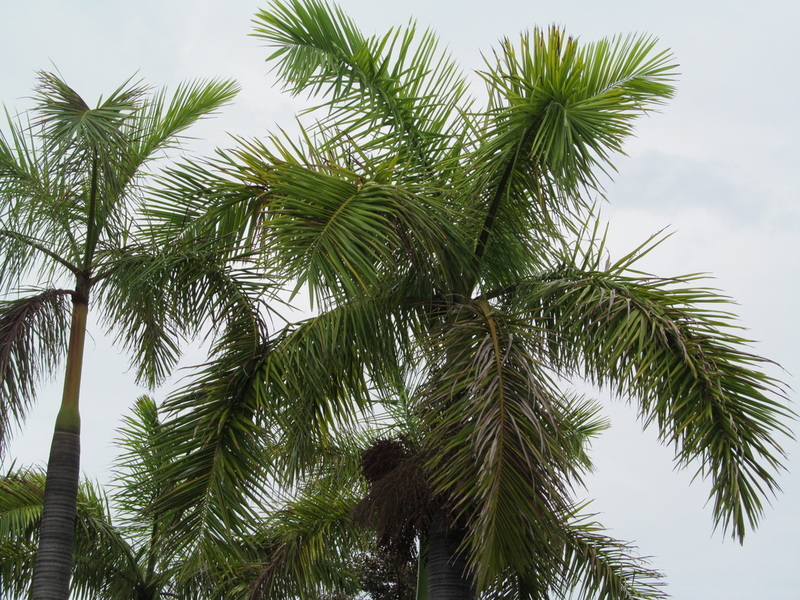 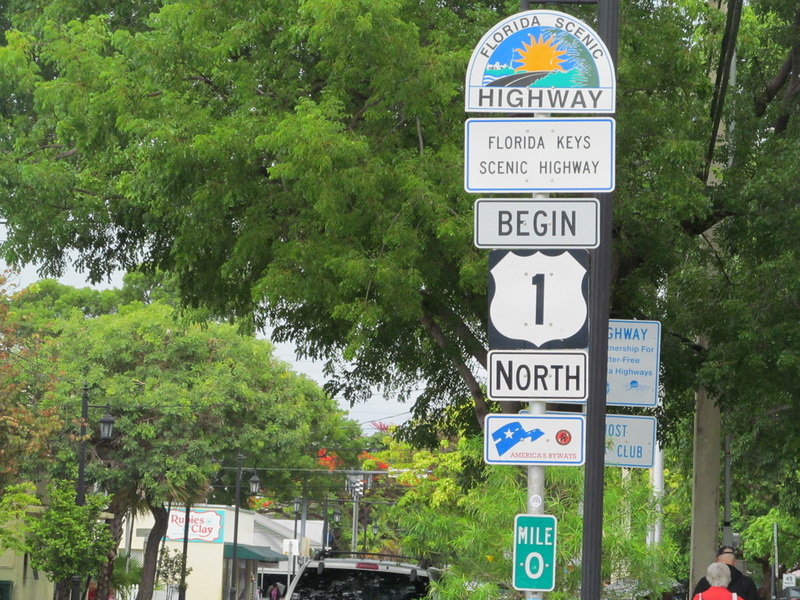 The third picture on the row below is of Mile 0 of the Florida Keys Scenic Highway. 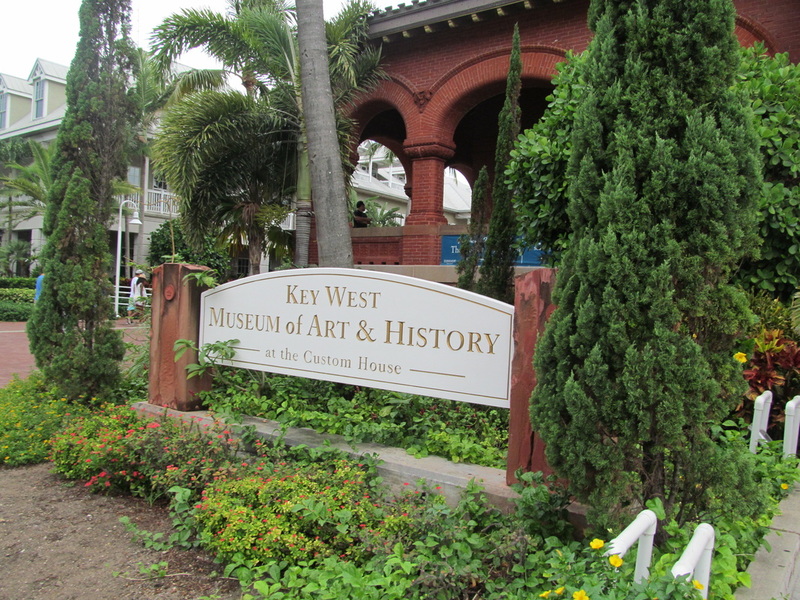 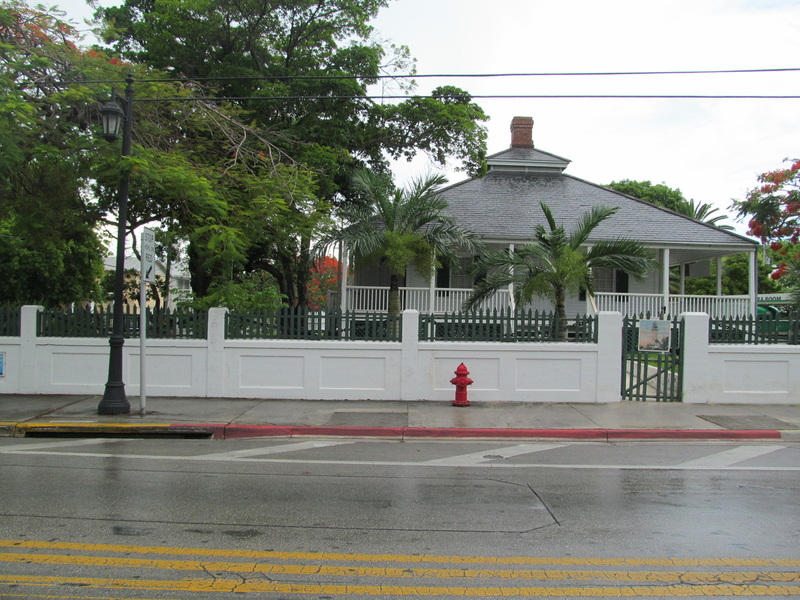 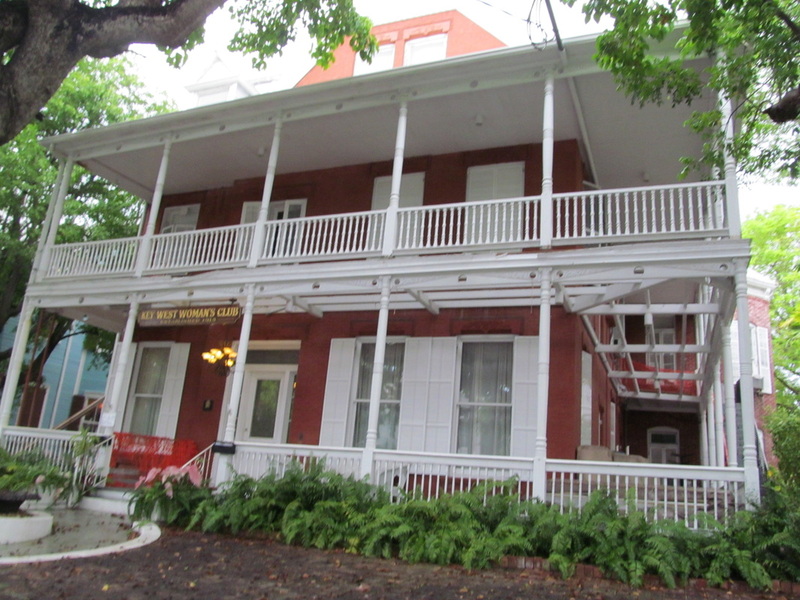 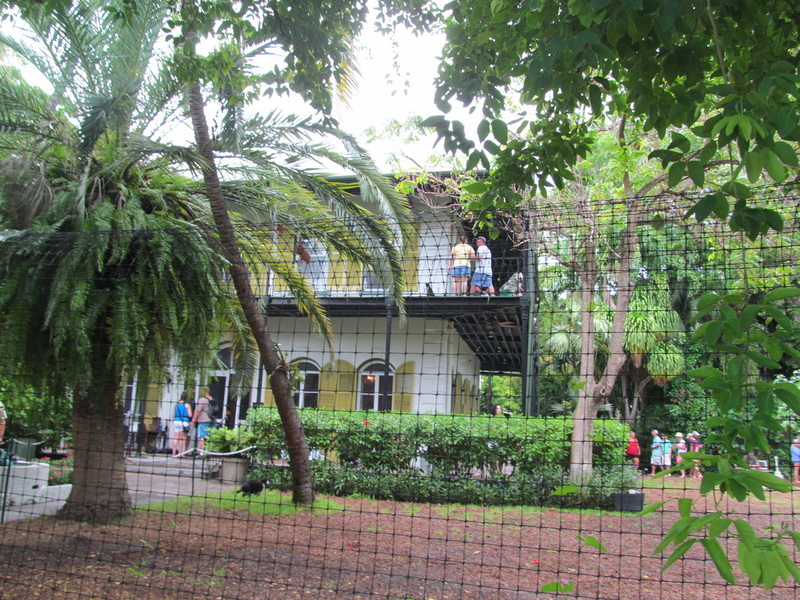 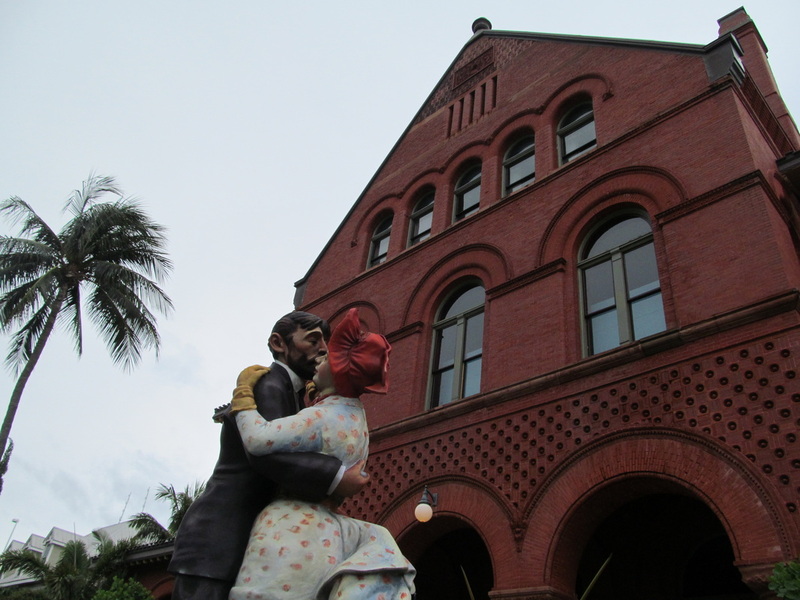 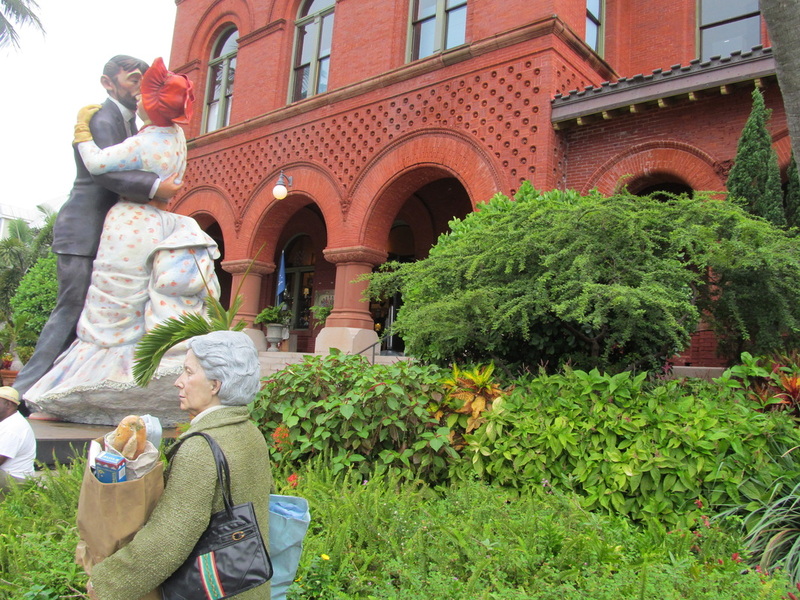 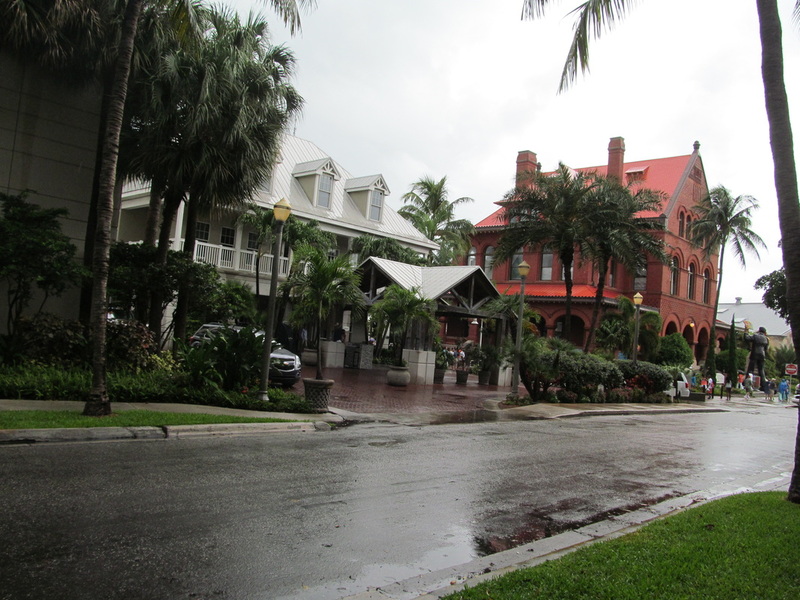 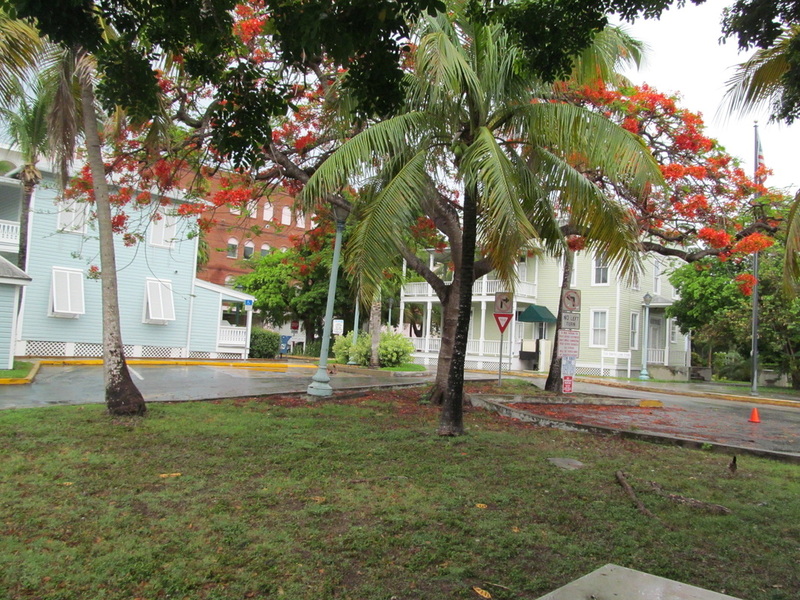 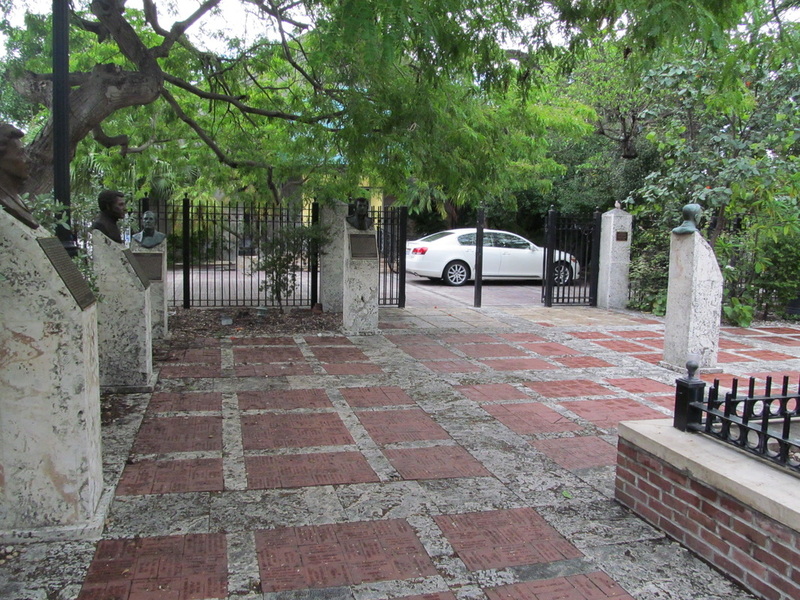 The Ernest Hemingway Home is a popular attraction in Key West that many cruise ship passengers visit. 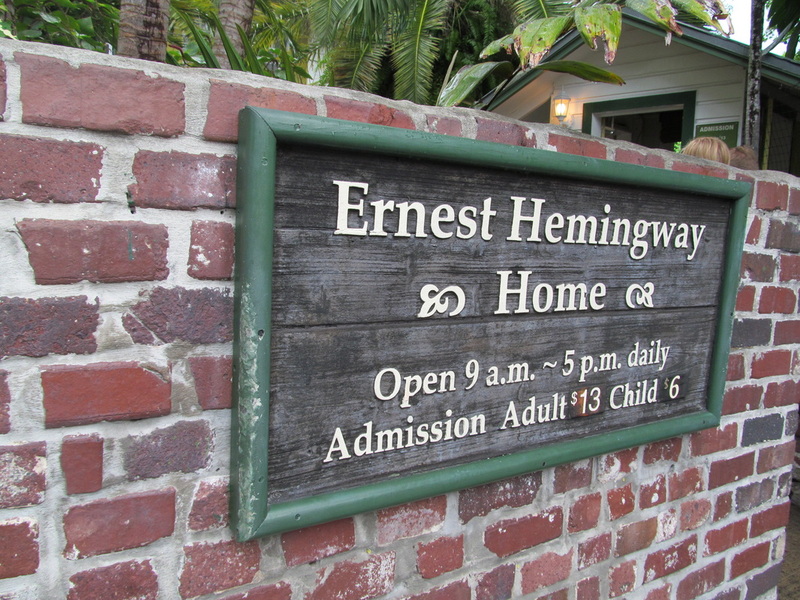 You must pay to go into the house and the yard surrounding the house. 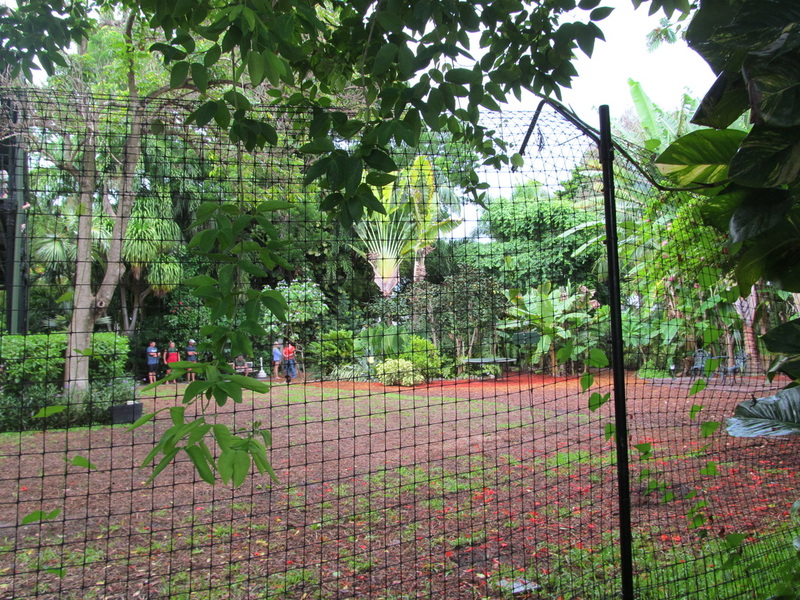 The fence was low and I was able to raise my camera above the fence to get some pictures. 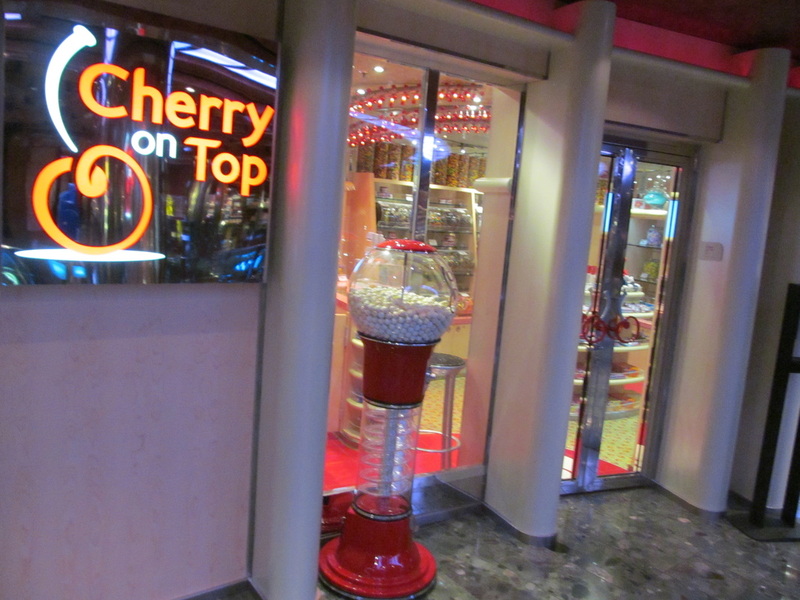 Otherwise you cannot see anything at eye level without paying to enter. 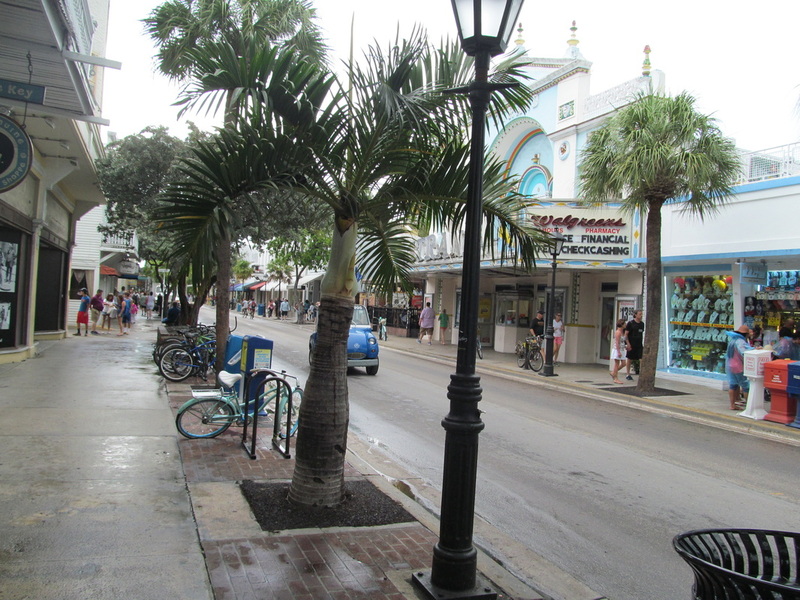 At this point in the day the weather was starting to change for the better. 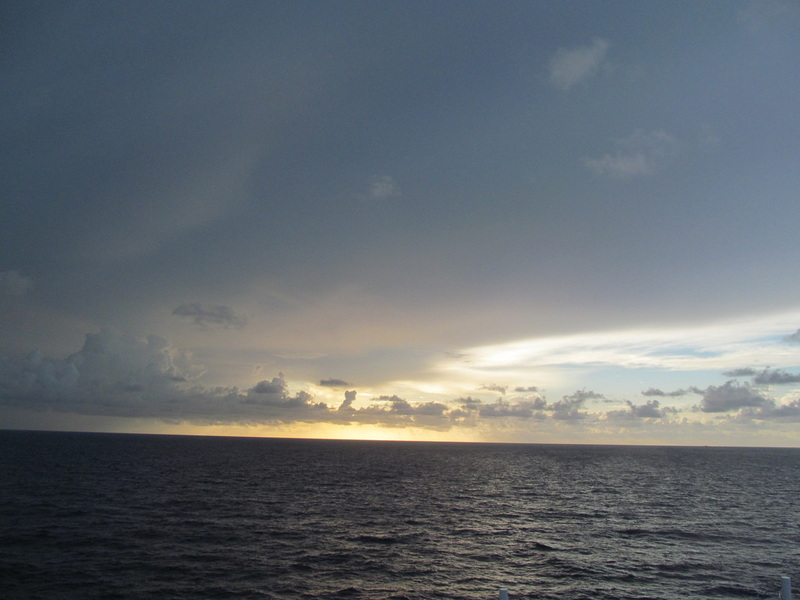 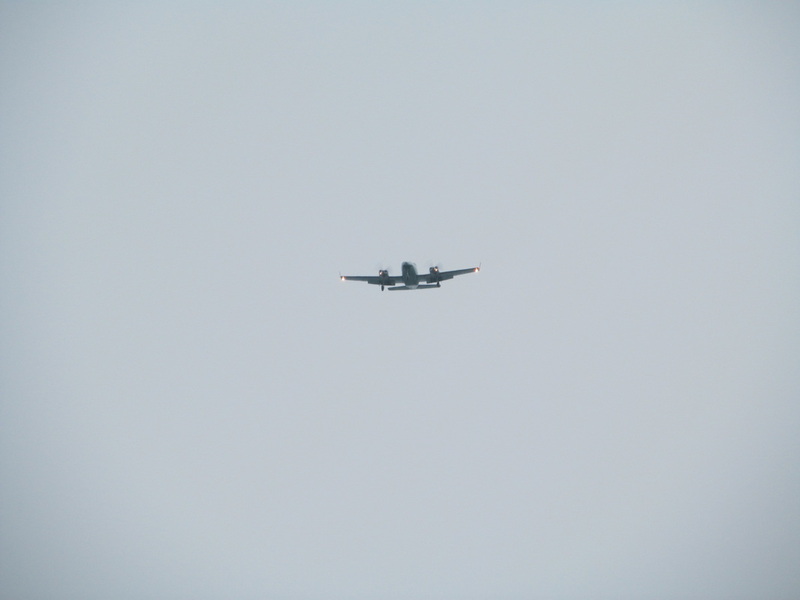 The rain had now completely stopped, but there were still dark clouds in the area. 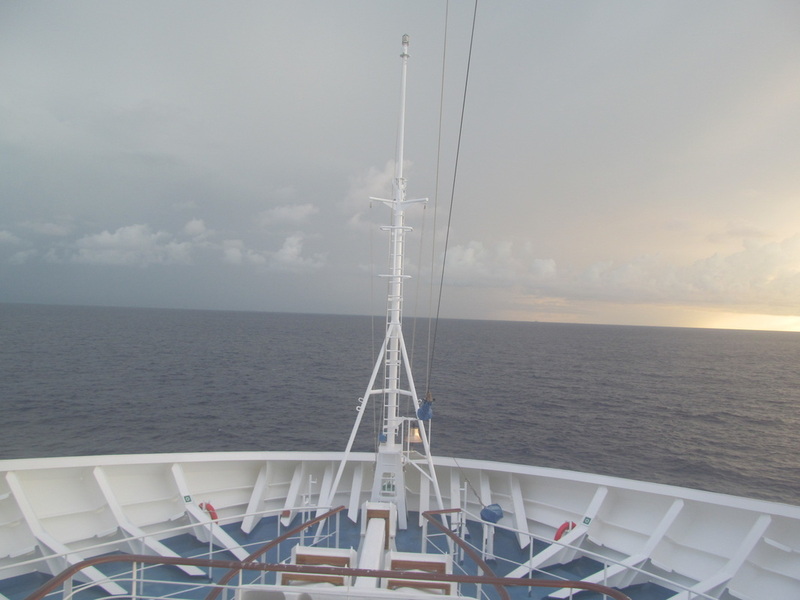 The quality of the pictures are much better when it is not raining and when the sun is out! 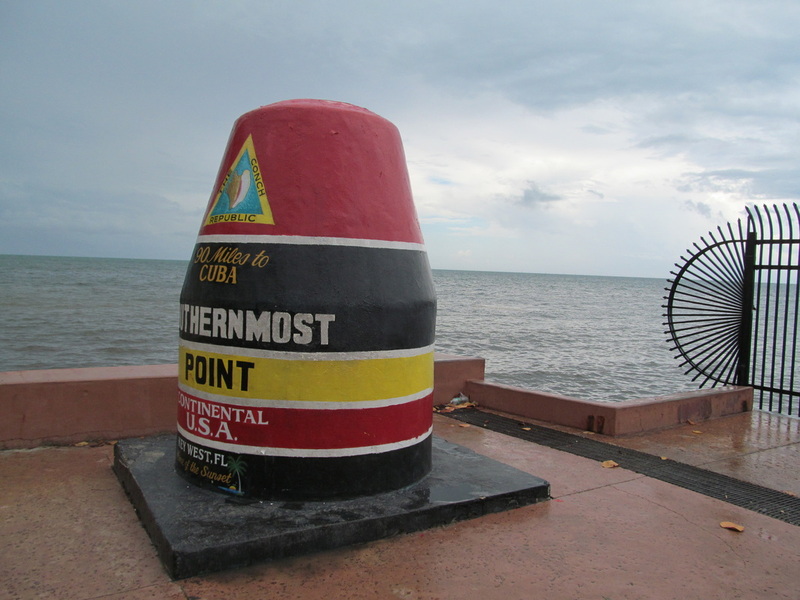 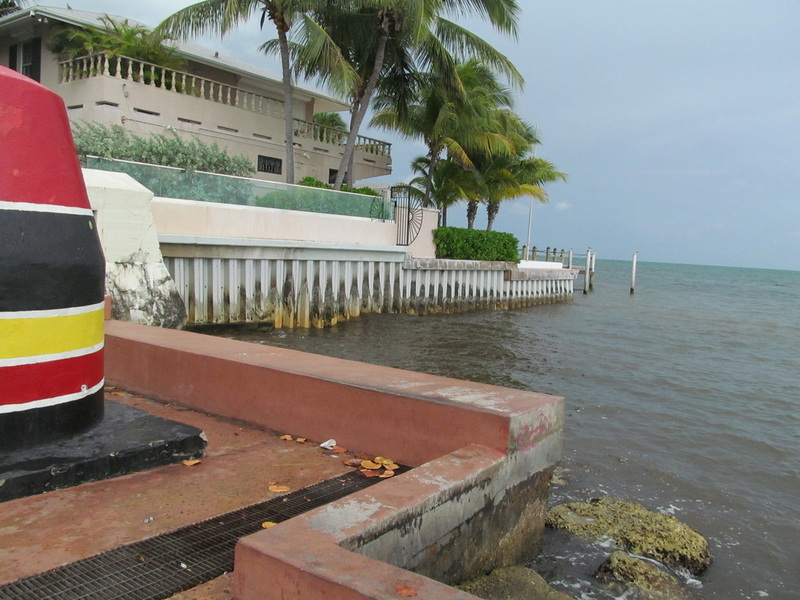 One of the most interesting things that I saw in Key West was the Southernmost Point of the Continental USA. 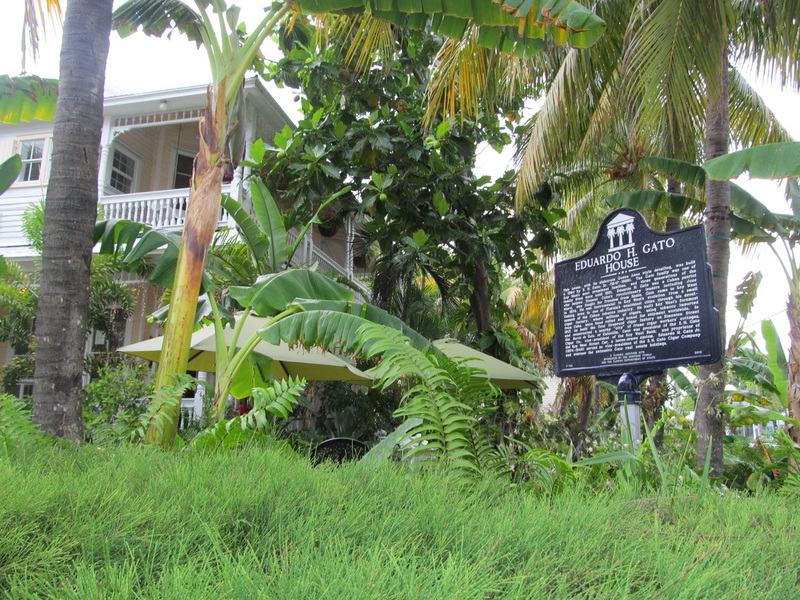 There was a long line of people that wanted to take pictures in this area, but between people I was able to snap a quick picture of the marker. 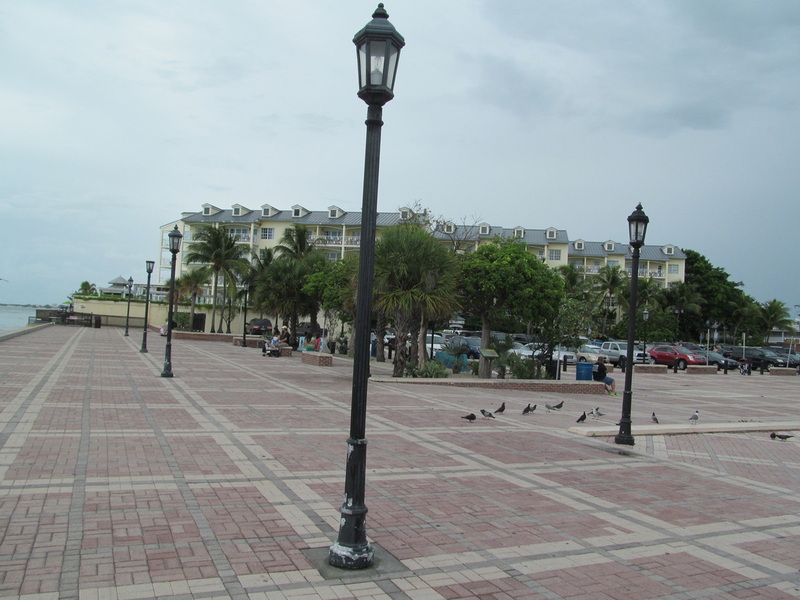 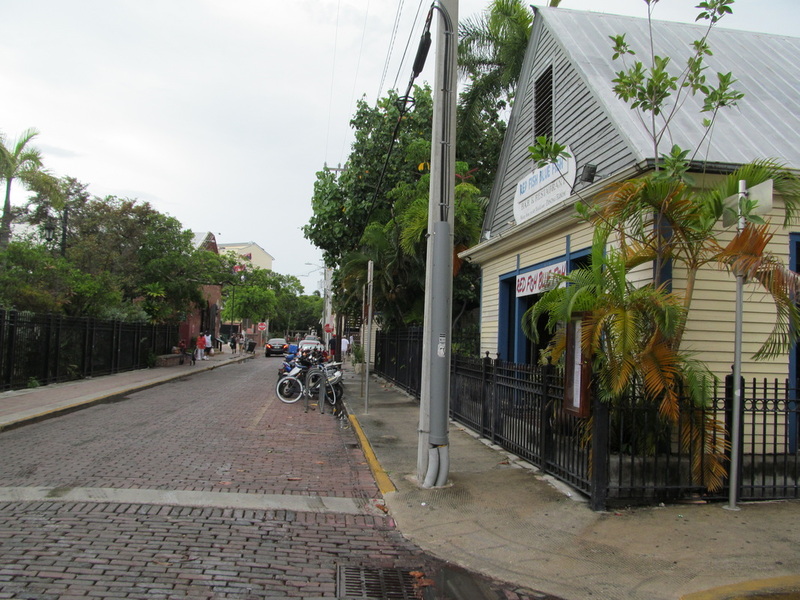 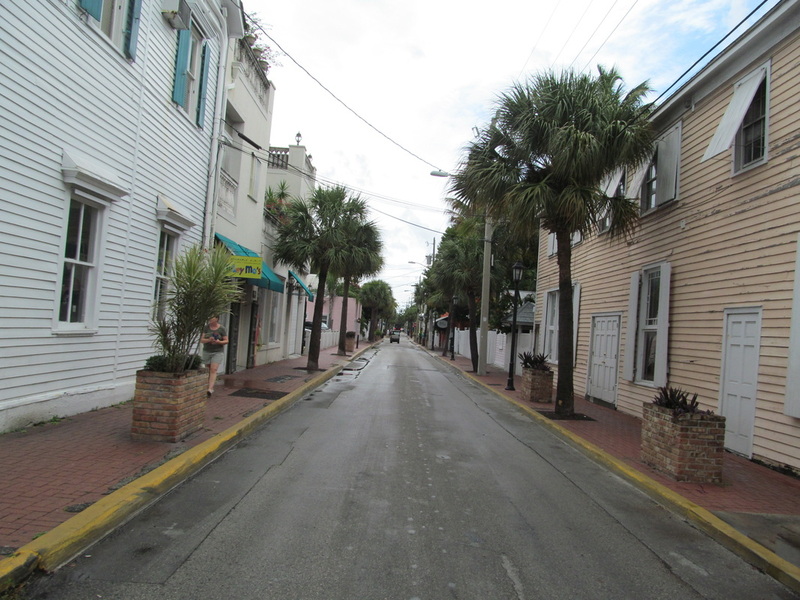 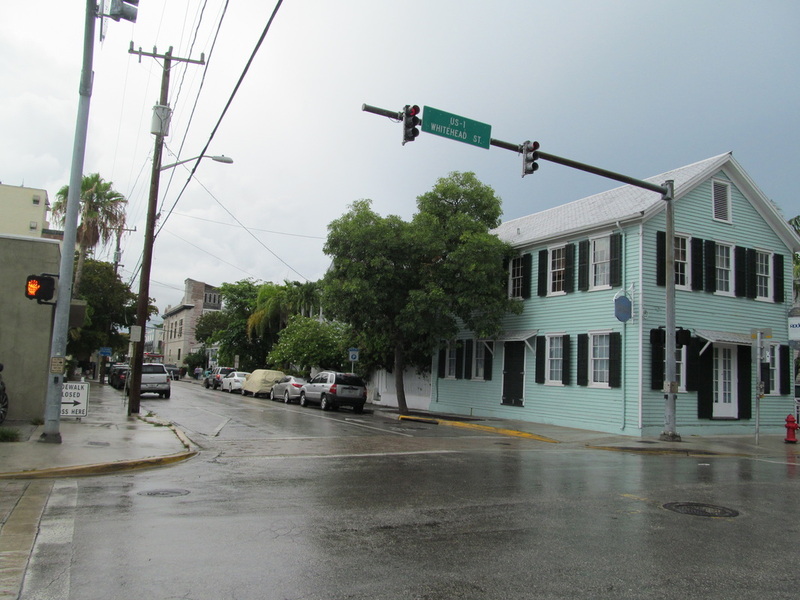 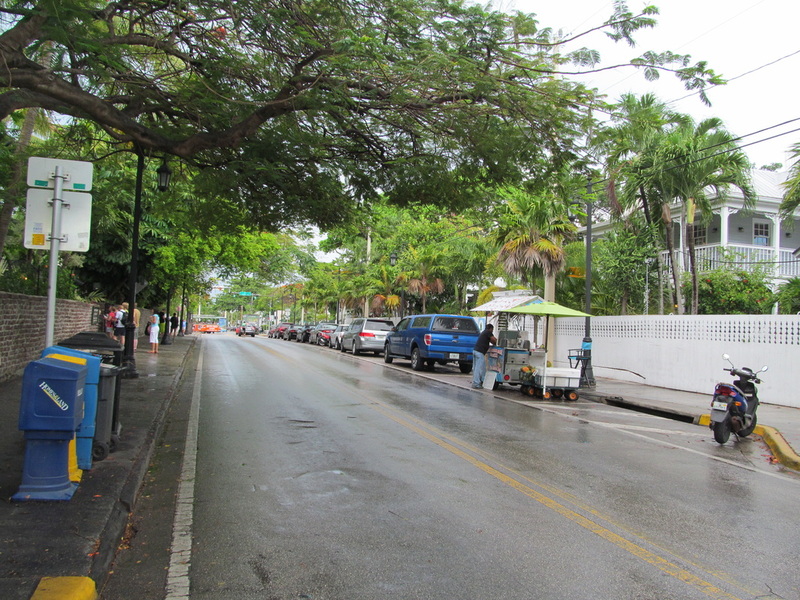 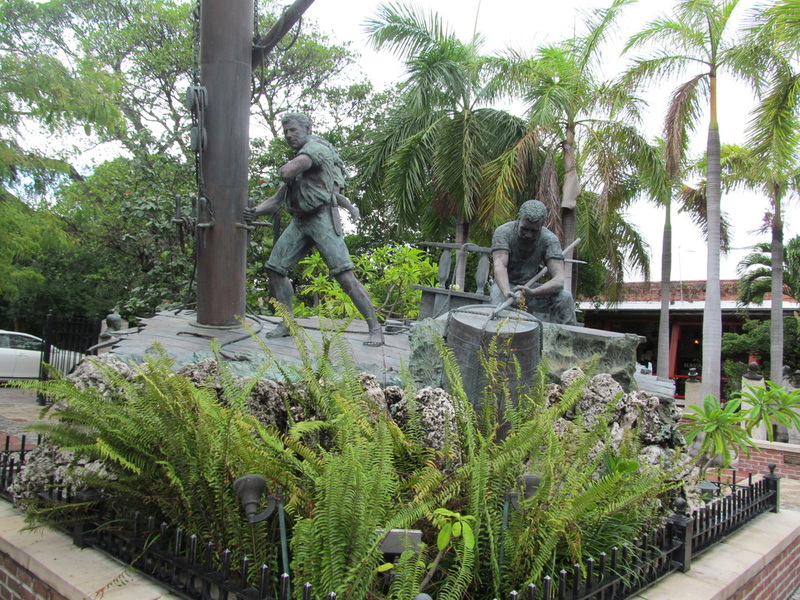 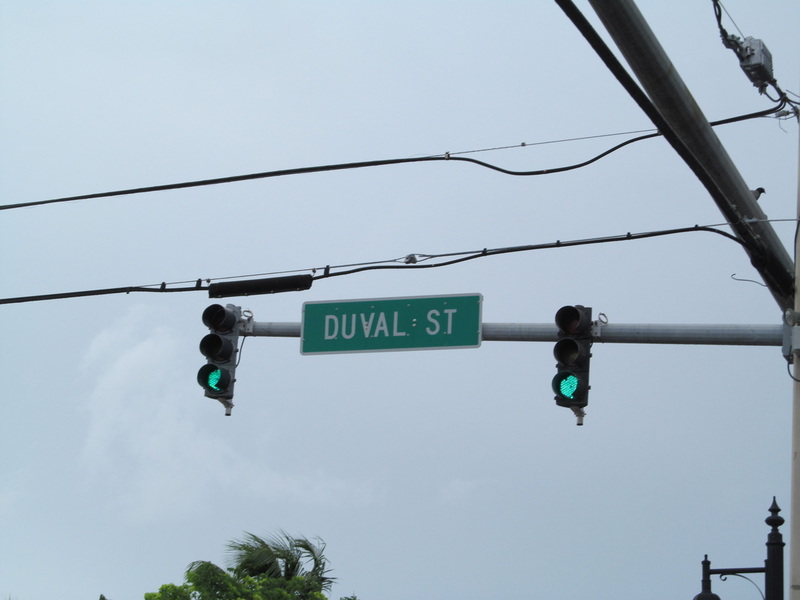 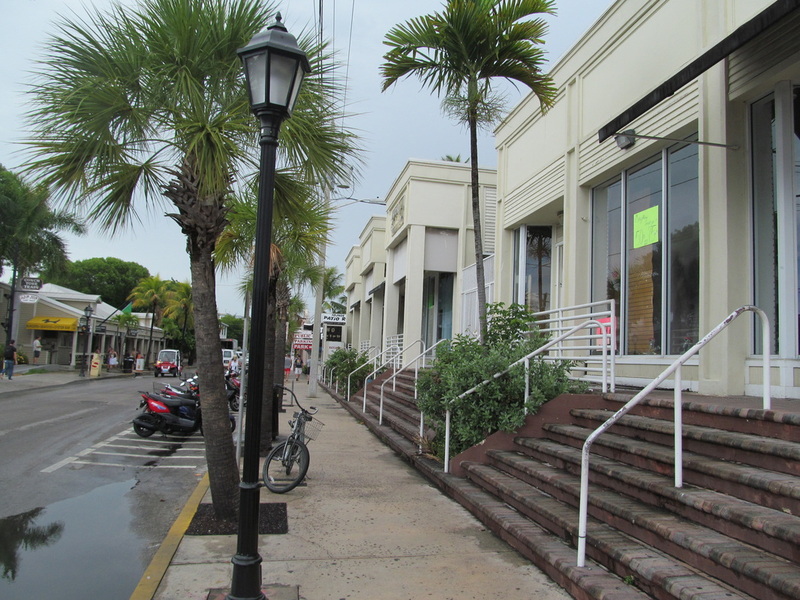 We took Duval Street to head back towards the area where the ship was docked. 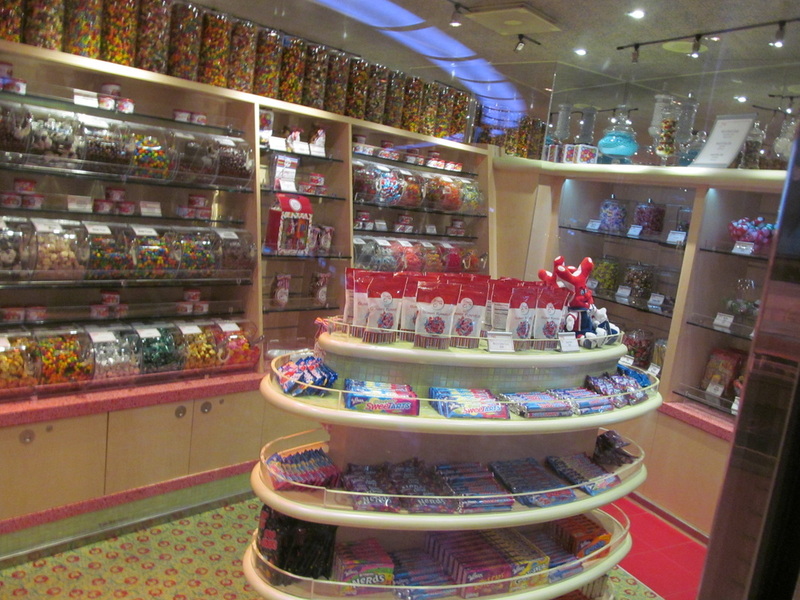 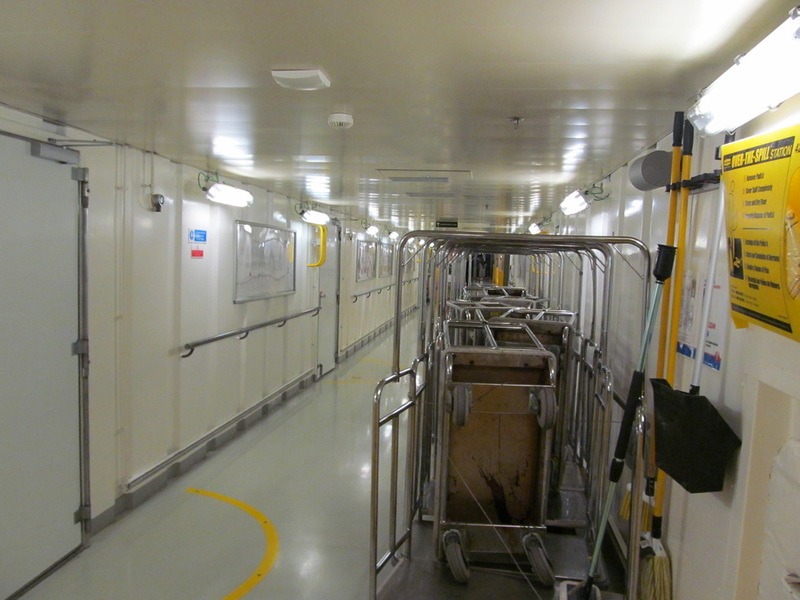 There was a very short line to get back onboard the ship. 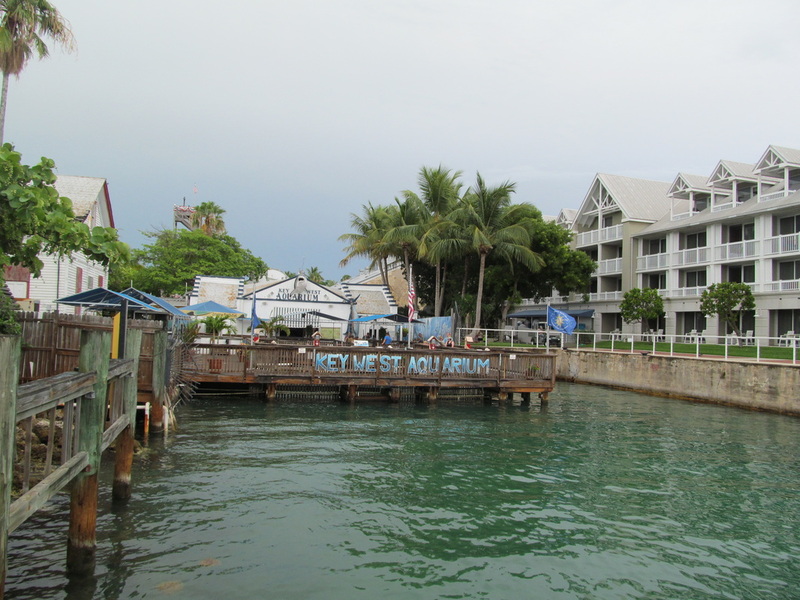 In order to access the pier each guest was asked to show his or her Sail & Sign card to a security guard. 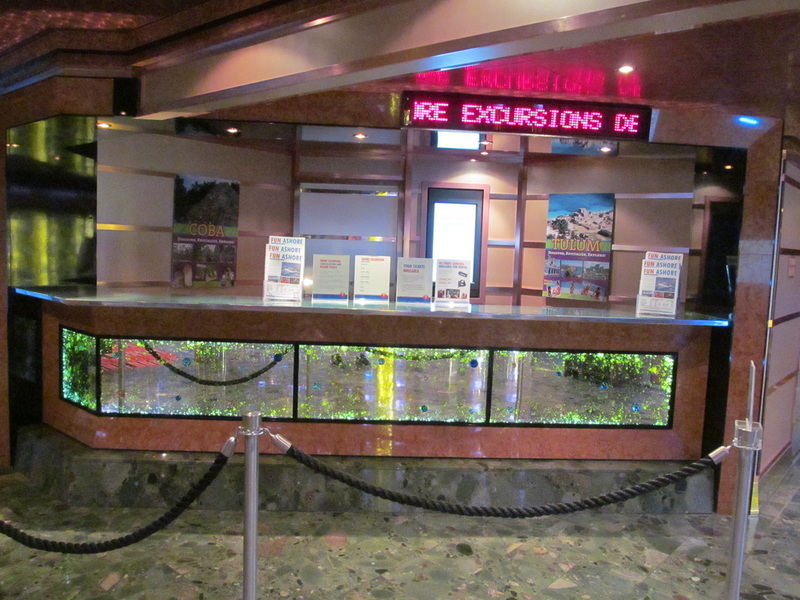 Some guests were asked to show photo identification as well. 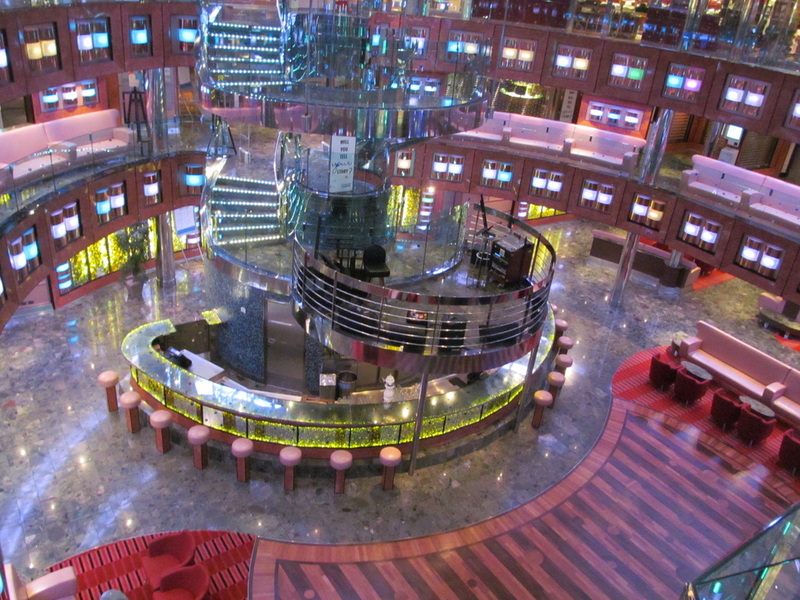 The ship advised that all guests over 16 needed photo identification in order to get back onboard. 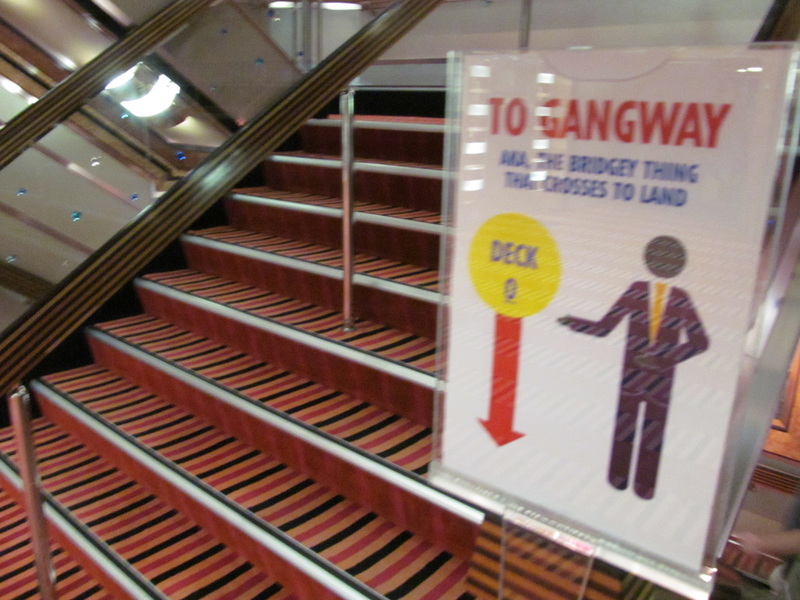 The crew gangway had nobody waiting on it. 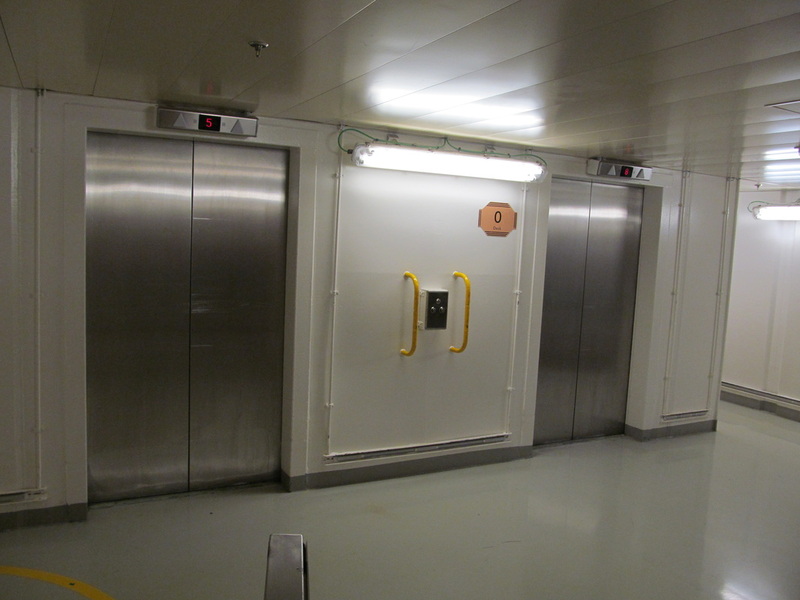 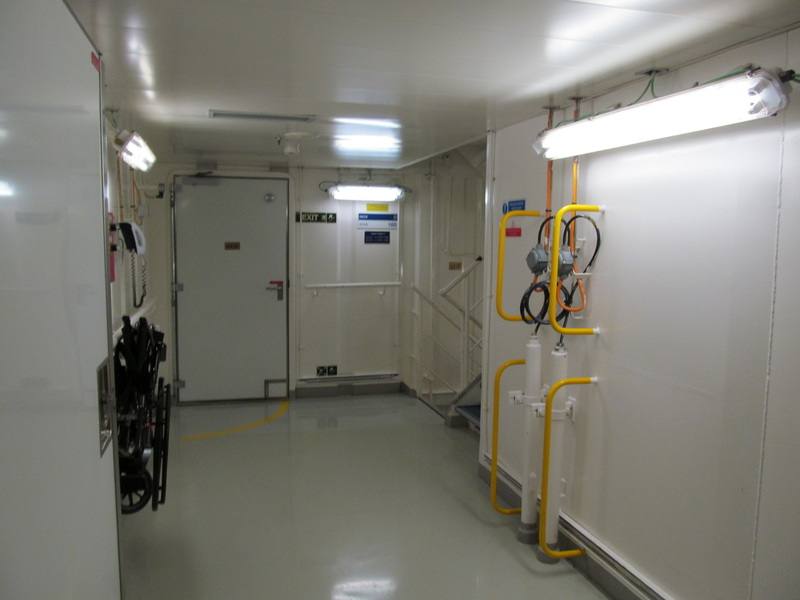 During peak passenger times guests would be instructed to use the crew gangway. 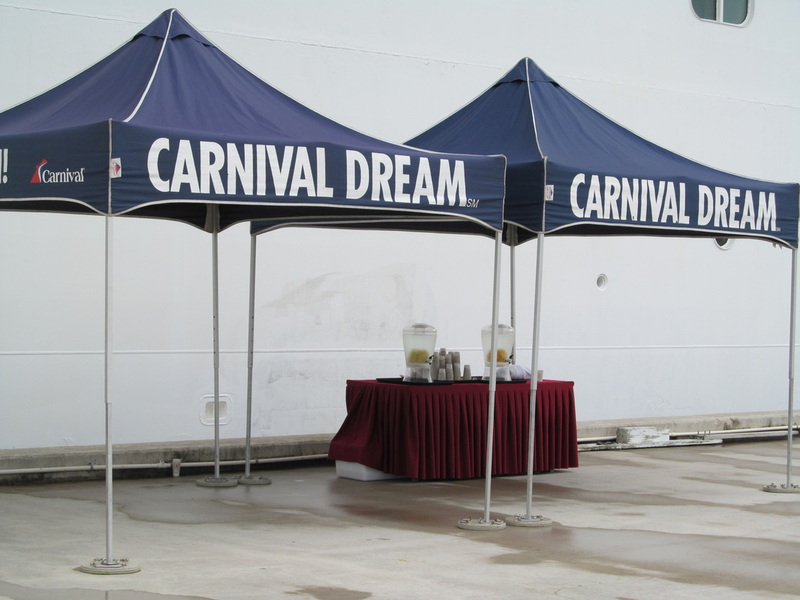 Carnival also sets up tents with cups of water for guests that are getting back on-board. 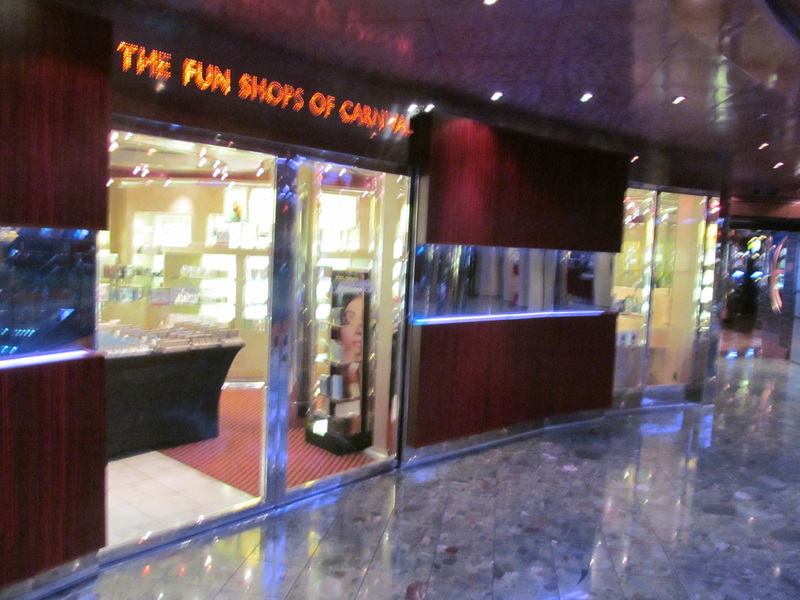 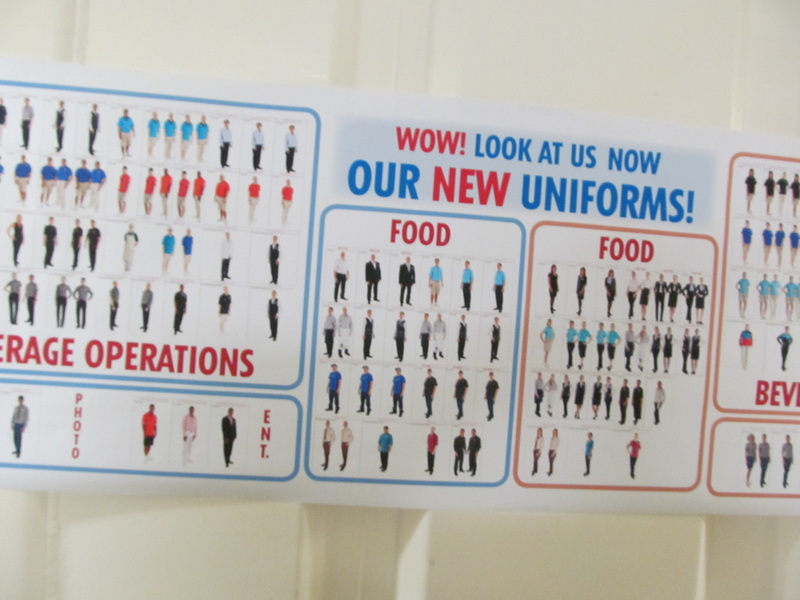 Once on-board the ship Sail & Sign cards had to be scanned by security and all guests had to go through metal detectors. 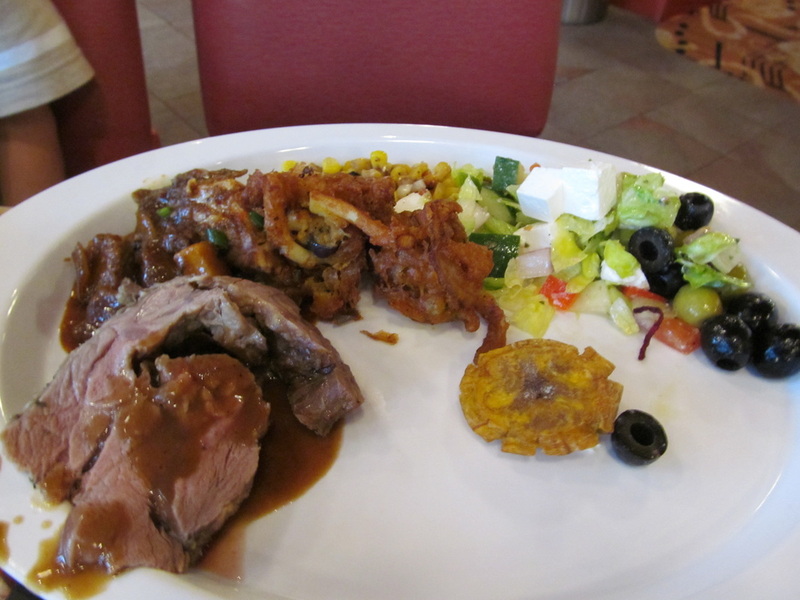 I had lunch in The Gathering (Lido Buffet). 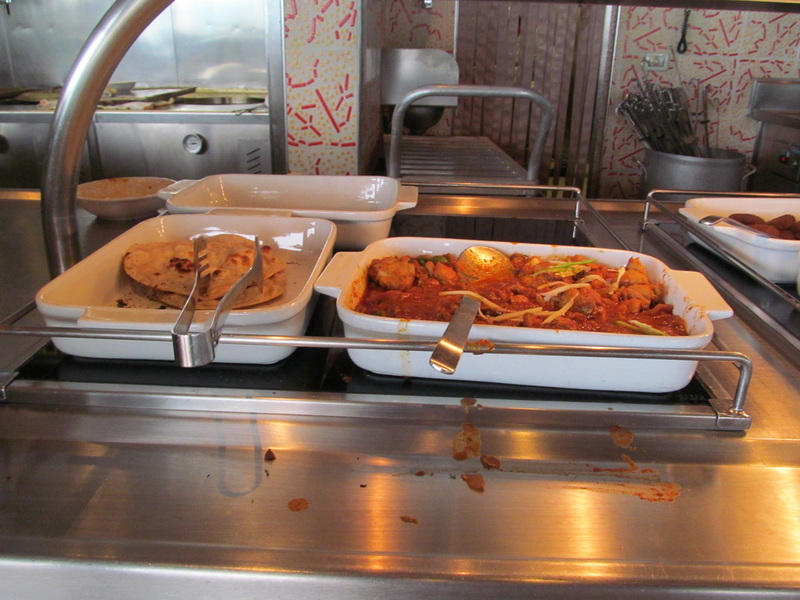 The Taste of the Nations buffet line was serving Caribbean food today. 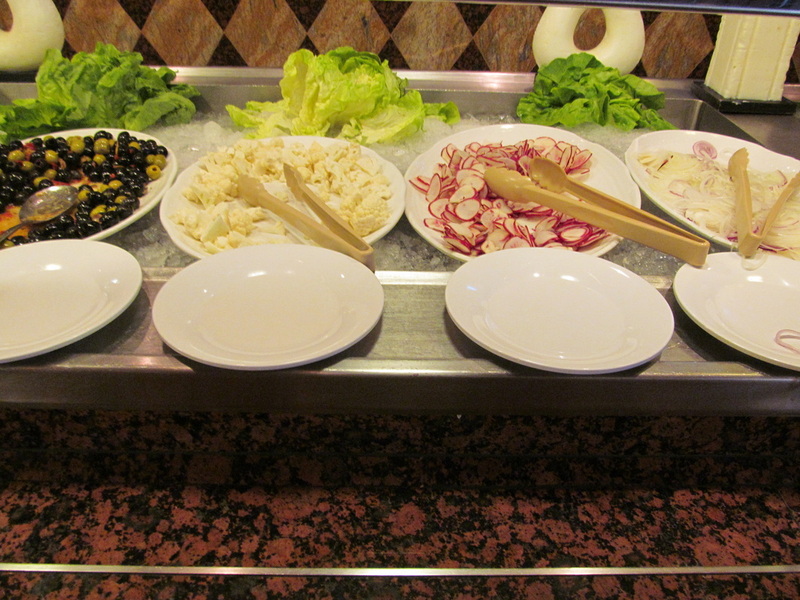 Most of the buffet lines opened around 12:00pm, except for the Pizzeria & Deli. 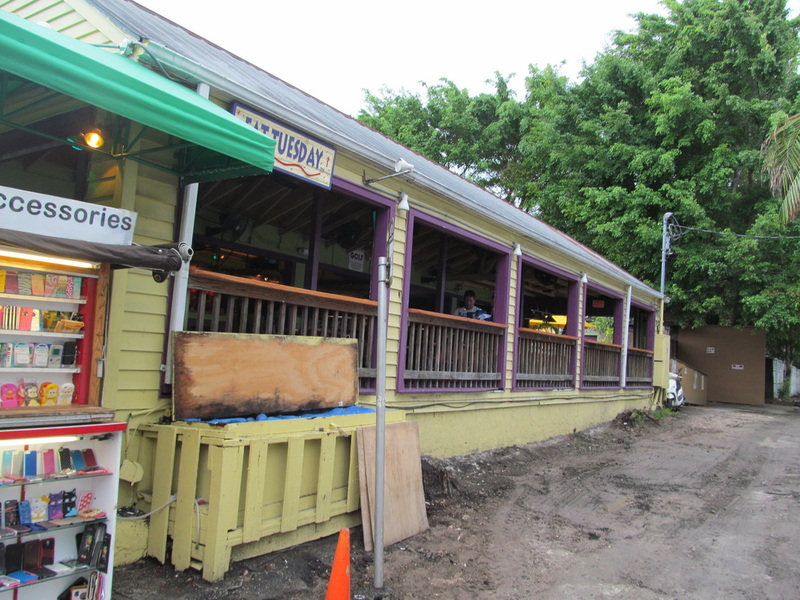 The Pizzeria is 24 hrs. 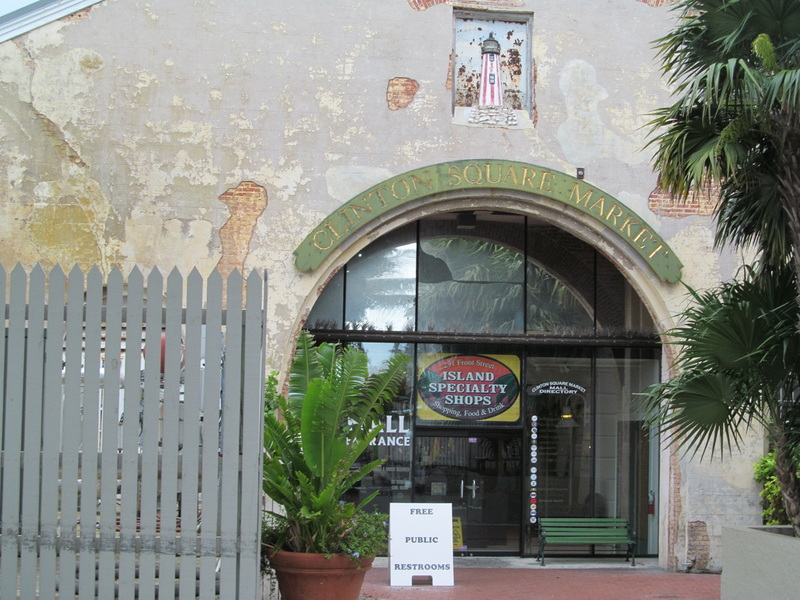 and the Deli is open from 11:00am - 11:00pm. 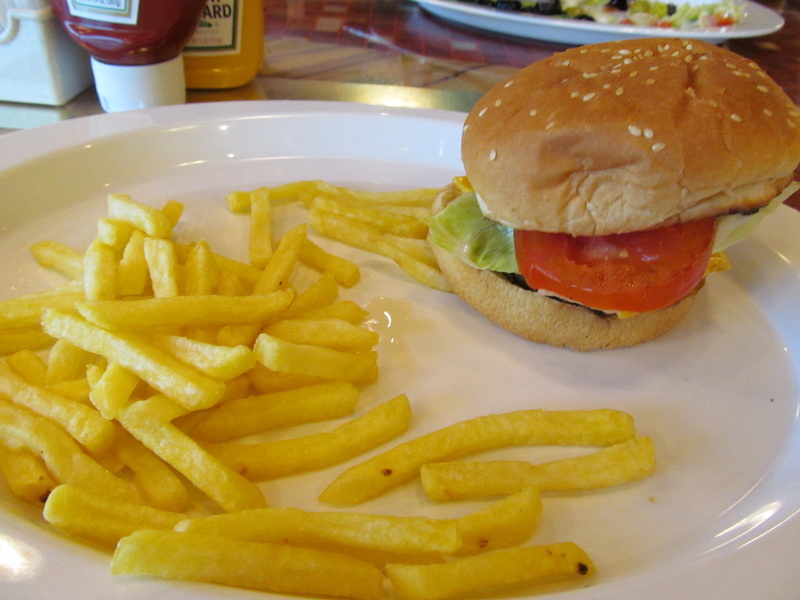 I tried the grill and got a hamburger and fries. 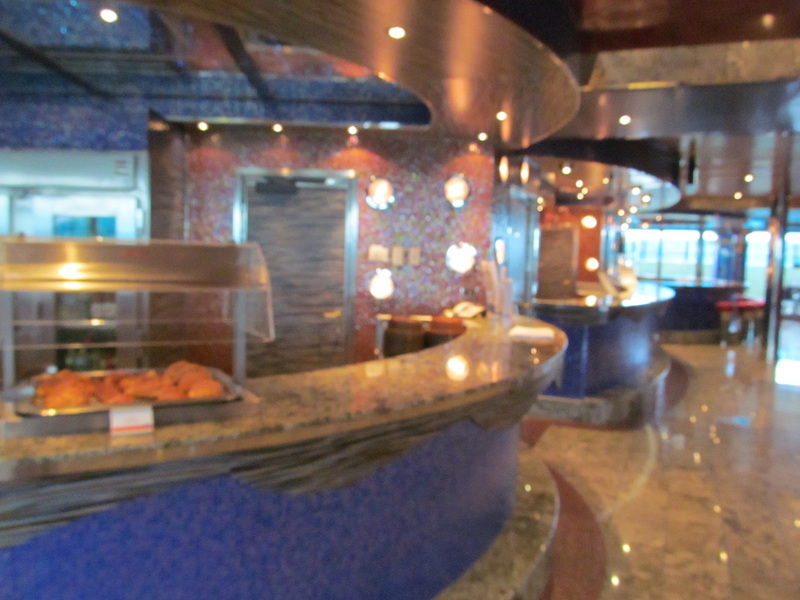 Both were very good, but the hamburger was not as good as the Guy's Burger I had on the Carnival Triumph last year. 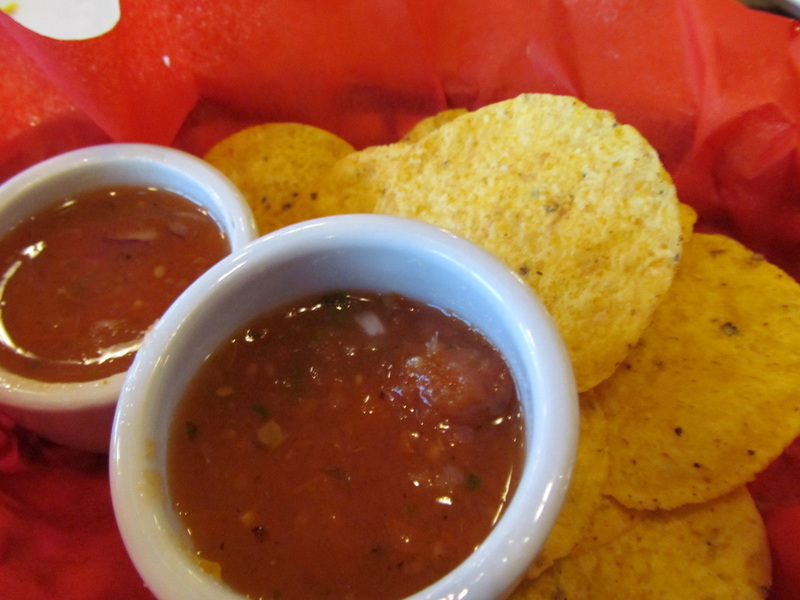 I also went to the Burrito Bar and only ordered chips & salsa. 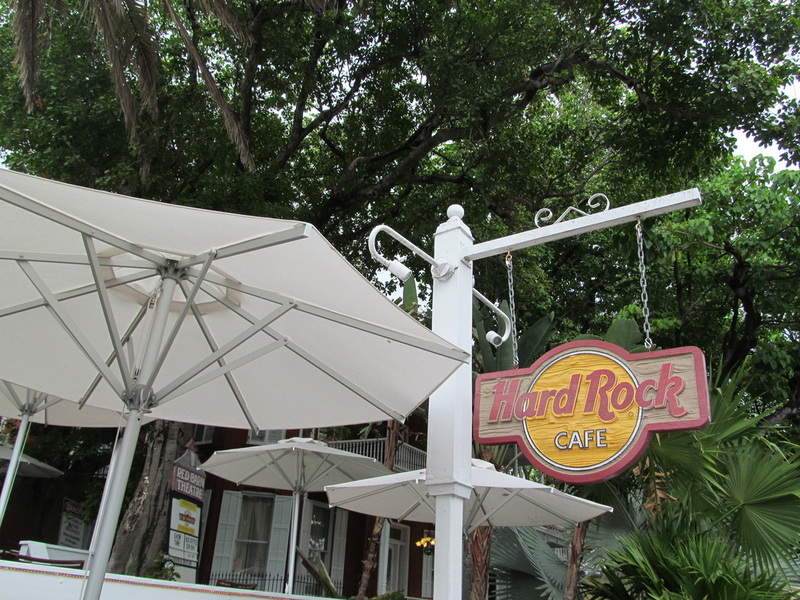 Continue To The 2nd Part of Today's Review!